Afghanistan continues to struggle to overcome decades of war and civil strife. Its political context remains complex and dominated by the Taliban insurgency, narcotics production, weak governance and incomplete rule of law. After more than fifteen years of state building Afghanistan remains a fragile state. Population displacement within and outside of Afghanistan, internal land use conflicts, changes in national political and economic ideologies, weak natural resource governance, variable climatic conditions (including drought), climate changes and land grabbing have resulted in a complex and unsettled land ownership and management situation. Land rights are perceived to be highly insecure and disputes are widespread. This instability undermines prospects for the greater investment needed to increase agricultural productivity, sustainably manage natural resources and enhance economic recovery in both rural and urban areas. It also increases the vulnerability of millions of Afghan households, especially women and children, to poverty and exploitation. Since the Bonn Agreement in 2001, the Government of the Islamic Republic of Afghanistan (GIRoA), with assistance from the international community, has worked to: (1) restart economic growth, especially in the agricultural sector and through the rehabilitation of irrigable land; (2) develop local institutions capable of meeting the population’s health and education needs; and (3) strengthen land tenure security through improvements to the legal framework, the implementation of a country-wide land survey, mapping and registration system, and the regularization of land rights in informal settlements. But economic growth and political stability will not be achieved unless and until the GIRoA removes constraints on access to land (especially urban and irrigated agricultural land), provides functional mechanisms to resolve disputes among competing claimants and provides tenure security to owners, lessees and all of those along the continuum of land rights holders in Afghanistan. A new Constitution enacted in 2004 sought to establish a legal framework for property rights that safeguards the right of individuals to own property. The 2007 Land Policy addressed bottlenecks in land rights administration and the overlapping authority of institutions and was followed by the 2008 Law on Managing Land Affairs, which lays out principles of land classification and documentation, governs settlement of land-rights disputes and encourages commercial investment in state-owned agricultural land with opportunities for long leases. The strategic vision for the Afghanistan Independent Land Authority (ARAZI) is to provide a balanced approach between (a) pro-poor land administration services in support of individual and collective tenure security through land registration, and (b) land allocation and the provision of land to support private sector investment in infrastructure, natural resources, agriculture and industry. The Ministry of Justice, however, estimates that 90 percent of Afghans continue to rely on customary law and local dispute-resolution mechanisms. Local customary systems are stressed by the need to manage the layers of competing interests: populations have moved to urban areas to avoid conflict and seek livelihoods, and populations displaced by earlier conflicts have made efforts to reclaim both rural and urban properties. Afghanistan’s development depends to a large extent on the efficient use of its land resources. Demand for agriculture land and for commercial development is high. Natural resources (including extractives) and agriculture are the main sectors with the potential to drive the required growth. However, water is scarce and decayed infrastructure systems remain key challenges for the country. The discovery of extensive mineral resources will put more pressure on the land sector. Mineral resources increase the value of land, intensifying the need to resolve competing claims, to secure land rights for local populations (paying particular attention to protecting the rights of the most marginalized members of communities) and to protect against potential negative impacts, such as large-scale land transactions without local involvement. There is a strengthening global trend towards improved governance of land tenure, as reflected in the adoption and dissemination of the United Nations’ Voluntary Guidelines on the Responsible Governance of Tenure of Land, Fisheries and Forests in the Context of National Food Security (VGGT). It is critical that Afghanistan develops an effective and transparent land, governance, administration and management system with the capacity to respond to all users’ needs in ways that provide a stable, secure, land and property rights system for citizens and potential investors in ways that preserve and protect the country’s natural resources. The international community continues to reaffirm its support to the Government of Afghanistan. At the NATO Warsaw Summit in July 2016, development partners pledged 4.5 billion USD per year in security grants for the next four years, while at the Brussels Conference on Afghanistan in October 2016, the international community pledged 3.8 billion USD per year in civilian donor grants for the same period. The sustained high levels of support indicate broad confidence amongst the international community in Afghanistan’s development prospects and in the significant progress the Government has made towards achieving reforms. At the same time, the goals of land policy, findings from the recently completed Land Governance Assessment Framework (LGAF), and substantial efforts by the country’s leading independent land authority, ARAZI, indicate several actionable steps to advance a stable land rights system in Afghanistan. Most of the pledges of the National Land Policy of 2007 have not yet been “absorbed” into the legal framework of the country. The Land Policy, while developed in a semi-participatory manner (only among public institutions), has been left without a matching legal framework to support it and therefore remains more as an aspirational reference document. Additionally, customary law, which represents most of the country’s land holders and users, remains poorly integrated with formal law and policy. A whole section in the National Land Policy is also dedicated to environmental sustainability, but again lacks corresponding laws to ensure proper implementation and contains no provisions for public monitoring. Further development of the legal framework should also support the 2017 amendments to the 2008 Law on Managing Land Affairs that: support informal dispute resolution, an important avenue for resolution especially among the poor who may not be able to afford to resolve problems in court; set aside protected areas as unavailable for lease; remove legal impediments created or permitted on the basis of gender, language, religion or marital status; and serve diverse land interests of society such as farm tenants, sharecroppers, workers, pastoralists and urban residents. Legal reforms and provisions that reflect the realities of customary land tenure, which is used most widely in rural Afghanistan. Customary law is only partially recognized in the current legal framework for land. Additionally, an estimated 80 percent of households have no formal documentation to acquire or prove their rights, and thus no protection of those rights by statutory law. This is also true in the case for collectively held lands, public lands and for lands used by Kuchi nomadic tribes. Insecure property rights are a critical underpinning of widespread land grabbing and usurpation. Further, although a number of the new provisions of the 2008 Law on Managing Land Affairs (LML) drafted in 2017 are well intentioned, in both substance and process they may fail to deliver on recognition of customary law. Both ARAZI and the findings of the LGAF call for continued evolution of land law that widens the scope of customary land tenure recognition to include these groups. Examples include supporting development and implementation of the draft Restitution Policy on Land Grabbing and the Customary Deed Registration Law, drafted by the Judicial Reform Commission in 2005, which stipulates the possibilities of formalization of non-documentary land ownership evidence. Proposed amendments to the LML by ARAZI also introduce a new type of land called “Special Village Land.” This proposed classification might ameliorate some of the challenges of the existing state/private land conflicts that, in essence, deny rights to community ownership. Also, by providing simple legal guidance and technical support as to how a community can voluntarily carry out fully inclusive community-based identification, adjudication and recording of all rights affecting its village or neighborhood area, a community can begin a first step toward identifying and eventually recording de facto tenure arrangements to inform further land law and administration initiatives. Numerous studies indicate that almost all land is registered in the name of the male head of household and that less than 2 percent of women own land, and most of those women are widows. The reasons for low rates of land ownership include strong social and customary barriers to property ownership by women, where patriarchal structures remain prevalent. Additionally, existing land laws have been inconsistent on the issue of discrimination against women and girls. Where law is helpful in determining land ownership, as in the case of the Constitution and Shari’a law, women and girls are often left without sufficient protection and assistance to realize their land rights. Women also have extremely limited access to both state and non-state dispute resolution fora, again because of strong and strictly enforced social norms. ARAZI has begun to remedy the practical and institutional obstacles to recognize and mitigate the official and hidden costs or registering land by way of issuance of Certificates of Occupancy that can now include up to three wives. Further progress is needed to: strengthen legal aid by hosting legal aid centers; raise awareness on the existing land laws helpful to women; decreasing logistical obstacles (allow geographical jurisdiction transfer) to registration; promote land registration in all spouses’ names; expand statutory justice coverage (mobile courts/admin units); and provide appropriate mechanisms to encourage women to approach formal and informal justice systems while sensitizing the rest of the community about the rights of women to equal access to land. More than 85 percent of the Afghan population lives in rural areas. Eighty percent of the country’s workforce is within an agricultural sector that comprises 60 percent of its gross domestic product (GDP). Forests provide essential livelihood options and climate mitigation functions, while the untapped mineral resources of the country have been estimated to run as high as one trillion dollars. The Afghan population, and the country as a whole, is decidedly dependent upon land and natural resources. However, further growth and investments should protect the resource access of the poor, prevent land grabbing and balance the interests of investors and small landholders. Both the Government and ARAZI have implemented initiatives to ensure land tenure security for all land rights, whether for individuals or private sector development, with the goal of a centralized system at ARAZI as one-stop-shop for land registration. As an interim measure, community-based land recording systems, which can be connected to ARAZI at a later time, may be a prudent and incremental approach. This can be done through the Community-Based Land Adjudication and Registration, or CBLAR, process. Other efforts can support opportunities for tenure individualization, to include: recognition and recordation of rights; prevention of illegal land transactions; land grabbing; or illegal expropriation. The Government of Afghanistan has indicated that there is insufficient information about the volume, value and location of Afghanistan’s mines. This complicates the bidding processes, encourages rampant speculation and makes royalty payments a matter of guesswork. The lack of a comprehensive regulatory scheme renders people, communities and the environment vulnerable to corruption and degradation. The weak policies currently in place do little to shield communities from the adverse effects of mining, especially since no matter who owns land, all subsurface resources are owned by the State. The Ministry of Mines and Petroleum (MoMP) lacks the trained personnel to execute its mandate and its efforts to improve this situation are inadequate. Nor does MoMP have the capacity to shut down illegal operations in most parts of the country. The government seeks to improve the stability of the sector through good governance that: confirms the precise size and potential exploitability; develops a strategic long-term vision, including knowledge driven development of the mining sector; more mineral processing within Afghanistan; integration with other sectors of the economy; revised and expanded legislation; a decentralized licensing system, continued efforts to share procurement information in the tender process, due diligence; and mechanisms for revenue and tax collection; environmental review; and an involved and educated civil society. Natural resources—land, water, forests and mineral deposits—are critical to the country’s prospects for a stable, peaceful and more economically viable future. An estimated 80 per cent of Afghans rely on agriculture, animal husbandry and artisanal mining for their daily survival. Because of the central role of these resources, any pressures that compromise access to or use of land can generate high demand, leading to potential conflicts over them. Climate change, conflict, population migrations, water scarcity and unclear land management, tenure and governance represent some of these challenges and are the source of numerous fracture lines in Afghanistan and the wider region. In Afghanistan, natural resources play a variety of roles in conflicts and at different scales, locations and intensities. The Government of Afghanistan has implemented a number of policies to address climate change, improve land tenure and address water scarcity, but requires support to implement best practice NRM structures, processes and laws in ways that: are contextually appropriate; facilitate and encourage public participation in NRM decision-making, long-term planning and implementation; encourage better data collection; and provide warnings to identify existing and potential disputes over natural resources. Insecure land tenure lies at the heart of many of the country’s conflicts. Arbitrary eviction, urban informality, internal displacement and accompanying insecurity, ethnically based land use conflicts over water and pastures, illicit poppy production, natural resources exploitation (especially forests and minerals), land grabbing, and food insecurity all compromise the security of individuals and communities. Moreover, violent disputes and clashes involving housing, land and property are both a fundamental cause of localized conflict and a perpetuation of weak land tenure, creating a perpetuating cycle of violence and tenure insecurity. Facilitating true tenure security will depend upon: understanding the specific tenure arrangements in varying geographical contexts; establishing clarity and recognition to the range of land rights and de facto needs for secure land tenure; developing solutions that are reasonable for the uses to which land tenure will be put; and protecting against arbitrary curtailment of land rights. Afghanistan is a country under pressure. Fourteen million Afghans, nearly half the population, are extremely poor or vulnerable to extreme poverty. More than 80 percent of the population and nearly 90 percent of the poor live in rural areas, and agriculture plays an important role in their livelihoods. The country’s farmland, pastures, forests and water resources have suffered from successive years of extreme drought and extended conflict. Poppy production is on the rise. Cities have expanded rapidly over the past decade without effective spatial plans and with limited access to formal land and housing. The result has been informal, low-density sprawl, increasing socio-spatial inequality and significant infrastructure deficiencies. Approximately one-third of Afghans live in five city regions: Kabul, Jalalabad, Mazar-i-Sharif, Herat and Khandahar, as well as 28 strategic district municipalities, making these regions crucial for social, economic and territorial transformation. More than half of the returning refugees are unable to return to their place of origin because they have no land or their land has been taken in their absence. In many areas, displacement and disintegration now characterize a society that had historically been defined by networks of reciprocity that guaranteed individual security and social support. Widows, female-headed households and nomadic communities are the most vulnerable. Development of a legal, land administration and institutional framework to secure and enhance tenure security has been underway over the past 15 years. While statutory laws and institutions seek to improve state land rights, support for private and customary land rights is less robust in formal law. Islamic law (Shari’a) and customary law dominate land relations in Afghanistan; the Civil Code recognizes the application of customary law with regard to land rights. Further legal reforms are required to harmonize law with the 2007 National Land Policy, provide for increased land tenure, identify the varying types of land holdings and tenure arrangements, address land grabbing and support land management at the local levels. Amendments to the Law on Managing Land Affairs have been proposed and include provisions to fight corruption and enable inclusion of customary documents as proof of ownership. These efforts are, to a degree, hampered by a tenure system that is complex and opaque, and the long period of war and political instability has further complicated the land tenure system. Land rights for Afghan citizens in both urban and rural areas remain insecure, especially for women despite helpful Shari’a law and the country’s Constitution, especially as regards inheritance and more formalized land rights respectively. The structural issues underpinning women’s lack of land access and land tenure insecurity include: illiteracy; low female employment; a weak and ineffective judicial system to enforce land laws; absence of awareness of laws; lack of physical access to legal documents; and prohibitive law enforcement mechanisms. Land administration in Afghanistan is complex, involving many formal (statutory) institutions and governance structures, as well a variety of informal (non-statutory) institutions especially those that are involved in the resolution of land issues and disputes. In general, the current institutional framework for land management and administration is not considered inclusive or pro-poor, despite some government efforts. Outdated systems, overlapping responsibilities, lack of capacity at local levels, conflicting systems for land ownership and uncertain or incomplete legal frameworks, compounded by decades of conflict and widespread displacement have resulted in competing claims to land. ARAZI, the country’s leading independent land authority, is tasked with maintaining records with respect to all land, both public and state, including maps, surveys, ownership records and land transactions and has been working earnestly to improve land administration. Despite these legal and policy advances, serious practical challenges remain to administering and managing land in Afghanistan. Land grabbing, or “land usurpation,” and concomitant informal development in both the urban and rural sectors by returnees, armed actors and powerful elites, remain largely unaddressed. Returnees from neighboring countries continue, with more than half a million crossing from Pakistan alone in 2016, after decades out of the country. However protracted conflict, extended periods of drought and deterioration of the rural economy have undermined Afghanistan’s historically strong centralized institutions and allowed for the rise of regional power structures, some of which are extra-legal. Legal and land administration institutions lack both the capacity and the authority to manage land and natural resources. For example, the country has ample water resources if effectively conserved, but the capacity to store, use and manage them is weak. However, the Government has taken important steps in improving water management. It has acknowledged that access to water is a right of the people and the Afghanistan National Development Strategy (ANDS) identifies water infrastructure as one of the key priorities. Afghanistan’s forests are seriously threatened despite their essential use for households for wood for fuel and construction, land for cultivation and grazing livestock and forest products such as nuts, tubers, fodder and fibers. Timber is in high demand on the international market and in neighboring Pakistan. Although commercial timber harvesting is illegal in Afghanistan, a systematic smuggling industry exists. Uncontrolled logging, urban encroachment and ineffective forest management have decimated Afghanistan’s forests. Tree coverage declined by almost 3 percent per year between 2000 and 2005. If current trends continue, all forests are likely to disappear in the next 30 years. The implications for deforestation and severe climate change are grave; drought is likely to be regarded as the norm by 2030, rather than as a temporary or cyclical event. Whereas water and forests are scarce resources, Afghanistan has abundant mineral resources, though most have not been successfully explored or developed. At least 24 potentially world-class mineral deposits have been identified as “Areas of Interest,” which represent both the mineral and its geographic location. The Afghan Ministry of Mines and Petroleum (MoMP) has indicated that the annual income through mining could reach as high as 3.5 billion USD, covering 77 percent of the total core budget of the Afghan government. Despite the potential in the sector, it remains undeveloped due to poor access, lack of energy and water, which is needed in mining operations, weak governance and insecurity. The government has sought to sustainably exploit its mineral resources and became a candidate for the Extractive Industries Transparency Initiative (EITI) in 2009. In much of the country, local elites, warlords and political factions control land and natural resources through a combination of physical force and customary legal regimes that reflect deeply entrenched power structures. Afghanistan’s population faces constraints on access to land, insecurity of tenure and the depletion of natural resources. The resurgence of the Taliban, continued conflict and growth of the opium poppy industry have created barriers to development. In many cases, reconstruction and development are taking place in a conflict-management context as opposed to a post-conflict setting. Afghans have been enduring the adverse consequences of forced displacement for decades, with Afghanistan having the largest number of its people living as refugees in protracted exile of any country in the world. It is estimated that 2.5 million registered Afghan refugees remain in neighboring countries, with possibly an equal number of undocumented migrants with similar protection needs in Iran and Pakistan. Internal displacement is also significant problem, with an estimated 1.2 million internally displaced persons (IDPs) in need of humanitarian assistance. The return of displaced people has been unevenly spread in terms of time and location, creating disproportionately large challenges to the absorption capacities of some districts and provinces. While the local impact of a massive influx of refugees on particular areas and their capacity to reintegrate these refugees depends on a range of factors, there is a real risk that shocks resulting from the influx have increased competition for resources or exacerbated pre-existing causes of conflict. There are 65 million hectares of land in Afghanistan, of which: 7.8 million hectares are agriculture lands; 30 million hectares are pastures; 8 million hectares are desert; 1.9 million hectares are forests; and 17.5 million hectares are mountains, rivers shores and rocky areas. According to ARAZI, less than 30 percent of properties in urban areas and 10 percent of properties in rural areas have been registered by official institutions of the state. More than 80 percent of the population and nearly 90 percent of the poor live in rural areas, and agriculture plays an important role in their livelihoods. Uses within agricultural lands are spatially diverse, ranging from intensive irrigated crop systems, in which farmers practice multiple cropping, to extensive livestock systems in dryland areas, to illicit opium poppy production. Opium production remains a significant feature of agricultural land use. The total area under opium poppy cultivation in Afghanistan was estimated at 201,000 hectares in 2016, a 10 percent increase from the previous year. Strong increases were observed in the Northern region and in Badghis province where the security situation has deteriorated since 2015. Ninety-three percent of opium poppy cultivation takes place in the Southern, Eastern and Western regions of the country (ARAZI 2014; World Bank 2014; UNODC 2016). Kabul houses approximately 41 percent of the urban population. Kabul and the four regional hubs of Herat, Mazar-i-Sharif, Kandahar and Jalalabad are home to 69 percent of the total urban population. Cities have expanded rapidly over the past decade without effective spatial plans and limited access to formal land and housing. The result has been: informal, low-density sprawl; increasing socio-spatial inequality; and significant infrastructure deficiencies. Many of Afghanistan’s urban challenges have a clear land use dimension, including land grabbing, inefficient use of land, tenure insecurity in informal settlements (70 percent of dwelling stock), limited access to well-located land for housing by middle- and low-income households, insufficient land for economic activity and undeveloped land-based financing for local service delivery (GIRoA 2015b; GIRoA 2014b; Popal 2014). In both rural and urban areas, over twenty years of civil conflict have left Afghanistan heavily contaminated with land mines and unexploded ordinances (UXO’s). A 2012 study by the Mine Action Coordination Center of Afghanistan further estimates that there are 5,489 hazardous areas remaining in Afghanistan, affecting 563 sq. km and 1,847 communities (MACCA 2012; GICHD 2012). Afghanistan’s total land area is about 652,090 square kilometers. The population is estimated at 34 million people. Of the 78 percent of the population that lives in rural areas, roughly 20 percent are classified as nomadic. 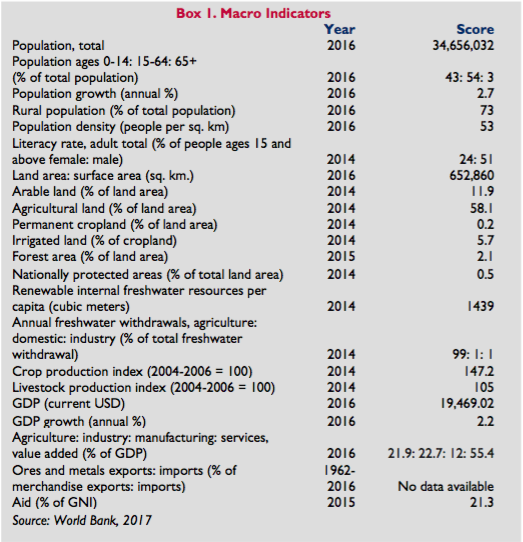 Agricultural land accounts for 58 percent of the total land area, but only 12 percent is useable farmland, with the balance pasture land, which supports the country’s large nomadic and semi- nomadic population and its livestock. Forests make up 1.3 percent of the country’s total land area. Deforestation is occurring at a rate of 3 percent per year. Roughly 0.3 percent of the total land area is designated as protected. 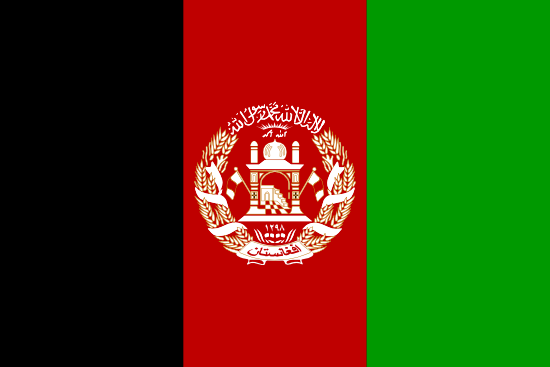 Afghanistan has more than 40 ethnic groups, the largest of which is the Pashtun (53 percent of the population), generally residing in the eastern and southern regions. The Tajiks in the northeast (17 percent) and Turkic groups in the northern plains (20 percent) are the second- and third-largest groups (ADB 2014; World Bank 2014). Unequal land distribution has a deep history; successive governments in Afghanistan have adopted land allocation policies as a means of rewarding patrons and consolidating power. Recent efforts to address continued inequities in landholdings began in 1978 when the communist government initiated new land reforms that reduced the ceiling for land holdings, allowed the state to seize excess land without paying compensation and provided for free distribution of land to landless and poor households. Decades later, to counter the continued widespread distribution of public lands the Government issued Decree 99 in April 2002 to freeze distribution of public land. Despite these efforts, land continues to be illegally occupied or controlled by powerful interests (Gebremedhin 2007). Distribution of land holdings in the agricultural sector, which accounts for 90 percent of the country’s manufacturing vis à vis agro-processing, employs 60 percent of the total Afghan workforce, and generates 25 percent of GDP, is especially problematic. Sixty percent of agricultural holdings are less than one hectare and represent 22 percent of croplands meaning that land fragmentation has implications for both demand for land for agricultural expansion and the risk of lower land ceilings for those who rely on land for food security and livelihoods (Alden Wiley 2003; Gebremedhin 2007; Afghanistan Reconstruction Trust Fund 2017). Approximately one-third of Afghans live in five city regions: Kabul, Jalalabad, Mazar-i-Sharif, Herat and Khandahar, as well as 28 strategic district municipalities, making these regions crucial for social, economic and territorial transformation. On average, 46 percent of total land area within the city regions is agricultural land, of which approximately 81 percent is irrigated for agriculture, reaffirming the relatively stable and central role of agriculture in these regions. Industrial land use comprises only 3 percent of built-up area. Within built-up areas, 40 percent of this land is residential. Most residential areas are irregular or informal housing developments. Socio-spatial exclusion and inequality are pervasive in all city regions. Living conditions are poor and those who are internally displaced are not integrated within the cities. For example, in the Herat city region, over 25,000 people are living in protracted displacement situations, without formal recognition of land or housing rights, despite the fact there is sufficient land, which is estimated to total more than 66,000 hectares of land within the five city regions (GIRoA 2016b; UNAMA 2015; World Bank 2017). During the past 15 years more than five million Afghan refugees have returned to their country, to both urban and rural areas. Most of the repatriates have not been able to return to their own homes due to insecurity. The government of Afghanistan has built townships in, for example, the eastern Nangarhar and Herat provinces and has provided ownership documents of residential plots to tens of thousands of returnees. However, many returnees assert that they have not yet received their designated land plots and the government-built townships lack essential services. Land usurpation, or land grabbing, by powerful individuals in these townships is widespread. Reports of land allocations to political and economic elites suggest that state land distribution in Afghanistan continues to be employed to reward patronage, solidify political loyalty and exercise and control power (GIRoA 2012c; LandAc 2016; Barshodost et al 2017). It is important to note the de facto land distribution that has occurred in the country. The chaotic political scenarios of the 1990s dominated by the mujaheddin and Taliban led many wealthier farmers to leave their lands during the various episodes of the war, trusting their land to relatives or simply abandoning it. Individual militia commanders have accumulated lands informally in a context of lawlessness prevailing in many parts of the country right after the demise of the Taliban. Finally, swift accumulation of wealth through poppy cultivation and opium trade is believed have led to some re- concentration of lands (Maletta 2007). The objective of current state land distribution efforts is to ensure sufficient and fair designation and distribution of state lands for infrastructure, state revenue-producing projects, agriculture and commercial activities, residential needs in urban areas and humanitarian requirements for adequate shelter including vulnerable populations such as IDPs and returnees. A combination of weak legislation, ill-considered resettlement schemes, strong ethnic and tribal ties and de facto enduring systems of customary tenure have limited distribution reforms’ intended impact. Specifically, a lack of overarching and integrated national policy on state land distribution, a lack of transparency and oversight by the institutions and government officials involved in land distribution, ineffective subnational governance, and limited desirable land (i.e., land that is fertile proximate to roads, infrastructure and economic opportunity) in urban, peri-urban areas, has constrained legitimate state efforts (Gaston and Dang 2015; UNAMA 2015; World Bank 2016b). The Afghanistan Constitution, passed in 2004, authorizes personal land ownership (except by foreigners) and protects land from state seizure unless the seizure is to secure a public interest and the owner is provided with prior and just compensation. In addition, the Constitution mandates land and housing distributions under certain conditions. The Law on Managing Land Affairs (LML) of 2008 sets forth the basic framework for land administration and management in Afghanistan. The LML sets out definitions for various land types and classifications, requirements for land deeds and principles governing: allocations of state land; land leasing; land expropriation; settlement of land rights and restoration of lands; pastureland management; and civil and criminal penalties for land usurpation. The law recognizes Shari’a and defers to applicable principles of Shari’a in some areas. Issues that are not covered by the LML are governed by the country’s Civil Code, which in large measure reflects the Hanafi school of Shari’a. Customary law dominates land relations in Afghanistan and the Civil Code recognizes the application of customary law with regard to land rights. Customary law is in large measure consistent with Shari’a, and Shari’a permits the practice of customary law so long as it does not interfere with tenets of Islam. Customary law systems vary but share the following characteristics: use of customary village councils (known in Dari as shura, or jirga in Pashtu) that employ mediation and arbitration techniques of dispute resolution; the application of principles of apology and forgiveness; and the concept of restorative justice (GIRoA 2004; GIRoA 2008; GIRoA 1977). In urban areas, the Municipality Law of 2000 contains provisions applicable to regulating and governing land within municipalities. ARAZI has responsibility for urban land management and administration by as set forth in the provisions of the LML (UN Habitat 2015; GIRoA 2000b). While statutory laws and institutions seek to secure state land rights, support for private and customary land ownership rights is less robust in formal law. The current land framework fails to sufficiently address and balance private ownership rights with the state’s need to obtain and access land for infrastructure and revenue-producing projects, such as mining. Expert reports have discussed the need to reform the LML to reflect the vision and mandate establishment of the newly independent ARAZI, harmonize law with the 2007 National Land Policy, provide for increased land tenure, identify the varying types of land holdings and tenure arrangements, address land grabbing and support land management at the local levels. Amendments to the LML have been proposed and include: provisions to fight corruption; inclusion of customary documents as proof of ownership, which can then be treated as formal land ownership; and streamlined land leasing processes (UNAMA 2014; Alden Wiley 2012; ARAZI 2012). Private Land—Land individually held without title, with a non-recognized title or with state formal title, as well as collectively held land without or with customary title or with documentation issued by previous government regimes. Transfer of private land can occur through sale, inheritance or compulsory land acquisition. Public Land—These lands include pastures (allocated for public use), forests, graveyards, roads, green areas, playgrounds; schools, universities, and hospitals. Public land is essentially state-owned land with a purpose designated by government Ministries or municipalities. These lands cannot be sold, leased, transferred or exchanged without a compelling case for reuse or repurpose. State Land—Includes forests, protected land, arid and virgin land (registered as state land and any land that is deemed public but is not registered in the book of government lands). Only arid and virgin land can be leased or sold provided certain conditions (Land Act 2016). Ownership. Ownership is the most common tenure type in Afghanistan. Ownership may be based on formal or customary law and ownership rights can extend to all land classifications. Ownership confers a right of exclusive possession of land and owners are entitled to use and dispose of land freely. Under the 2008 Law on Managing Land Affairs, all land not proved to be private is deemed to be state land (GIRoA 2008). Leasehold. The 2008 Law on Managing Land Affairs permits leasing between private parties, subject to requirements for written leases that describe the land and set forth the agreement of the parties regarding the length of the lease and payment terms. For purposes of attracting investment, the Ministry of Agriculture, Irrigation and Livestock (MAIL) can lease agricultural land to individuals and entities for purposes of agricultural activities for periods up to 50 years for fertile land and 90 years for virgin and arid (i.e., uncultivated) land. The MAIL can lease virgin and arid land for non-agricultural investment purposes with the agreement of other departments and consistent with considerations of land type and proportion. Other ministries and departments can lease land for non-investment purposes for periods up to five years. Leases of private land, which have primarily been governed by customary law, are generally quite brief, often extending only a season. Sharecropping is a common arrangement: the landowner contracts with the sharecropper to cultivate the land, with the parties agreeing to terms regarding the production shares and payment for inputs (GIRoA 2008; UN Habitat 2017). Agreed Rights of Access. The 2008 Law on Managing Land Affairs provides that pasture land is public property that neither the state nor any individual can possess (except as otherwise provided by Shari’a), and which must be kept unoccupied for public use for activities such as grazing and threshing grounds. Customary law provides that individuals and communities can obtain exclusive or non-exclusive rights of access to government-owned pasture land through customary use and deeds (GIRoA 2008b; UN Habitat 2017). Occupancy Rights. In urban areas, landholders in formal settlements generally have formal rights to the land. Occupants of informal settlements, including squatters, usually have some type of informal rights that are based on principles of customary law, the nature of the land and the means by which the occupants took possession of the land. The 2007 Land Policy permits the regularization of rights from informal settlement holdings but implementing legislation has yet to be enacted (GIRoA 2007). Mortgage. Formal and customary law recognize two types of land mortgage: one type operates as a debt secured by the land. The second type, which is the most common, is a use mortgage under which the lender takes possession of the land until the borrower repays the debt (UN Habitat 2017). It is important to note that despite the relatively straightforward tenure types presented above, land ownership and land access rights in Afghanistan are very complex and opaque, and the long period of war and political instability has further complicated the land tenure system. At any given time, for example, a single farmer may be owner, tenant or sharecropper and may be in transition from one status to another with respect to one or more of his plots (UN Habitat 2017; Alden Wiley 2003). Land rights for Afghan citizens in both urban and rural areas are insecure. Afghanistan’s land is vested: (1) individually in private individuals and entities; (2) communally in families, clans; (3) in communities, for example pastures; and (4) in the government. Land ownership can be acquired through purchase, government land allocation and other forms of transfer of ownership, such as through inheritance. Under current law, all untitled land is characterized as state land unless a person can show ownership through a legally valid deed, which is the basic unit of registration evidencing the transaction in land. Registration is a judicial function in which primary court judges have responsibility to draft and archive legal deeds and ARAZI certifies the identity of the parties. Acquiring and registering a deed is costly and difficult. Additionally, a title or registration of title is no guarantee of establishing ownership and obtaining land rights. Title deeds may be registered with numerous institutions at several locations, creating significant opportunities for fraud and corruption with multiple titles being registered at different locations for the same or overlapping areas of land (GIRoA 2008; LandAc 2015; UNAMA 2014). Most people, then, acquire rural land through inheritance transfers, with no documents or records to establish ownership of the land they are occupying. Nomadic or semi-nomadic people may acquire pasture lands for grazing their livestock through application to the local authorities stating the need for land and through the identification of vacant land (mawat). Individuals can apply for ownership rights to mawat land by demonstrating that the land has not been not cultivated, improved or is under ownership, and that they will agree to either cultivate or improve the land. These practical solutions to owning and accessing rural land completely bypass the formal land system, resulting in an informal shadow land economy. As a result, the majority of those occupying land in Afghanistan are legally “landless.” Private land disputes are generally put forward to a shura or jirga for resolution. In rural areas the key drivers of continued land insecurity are: (1) a history of inequitable relations within communities with regard to access and rights to land and water; (2) multiple unresolved interests over the same land, including rights of nomads; (3) failure to develop accepted principles governing holdings of non-agricultural land; and (4) continuing violence and disorder, uncontrolled poppy production, warlordism, land invasions and ethnic disputes (GIRoA 2008; UNAMA 2014). In urban areas, most people acquire land through purchase, lease or squatting. Settlers on unplanned urban lands typically have customary deeds or occupancy rights, some of which have been regularized or benefit from the “blind eye” of the government (World Bank 2005). Shari’a law is the strongest acknowledgment of the land and tenure rights of women by way of its guidance regarding inheritance for wives and daughters. Still, women face significant impediments to asserting their land rights to mahr (dowry) or those acquired through inheritance because of cultural norms and the lack of access to either the formal or informal systems. In urban settings, female heads of household and widows are, anecdotally, increasingly asserting their rights to land, but they are unlikely to try to register their rights formally because the process is time consuming and costly (UN Woman 2011). In both urban and rural areas, criticism of the Law on Managing Land Affairs of 2008 asserts that it fails to protect customary land tenure because of its unrealistic and often unattainable requirements that rely on documents to establish legal ownership and convert such documents into a formal deed (GIRoA 2008; UNAMA 2014). Women’s rights to land must be considered within the context of women’s rights in Afghanistan as a whole, which are among some of the worst in the world and include: attacks on women in public life; violence against women; child and forced marriage; lack of access to justice; and lack of girls’ access to education. Women’s land ownership in Afghanistan has two diverging dimensions: (1) The legal guarantees to rights of ownership; and (2) the de facto access to land and accompanying rights. On paper, women in Afghanistan enjoy rights to land. The Constitution provides that women cannot be precluded from owning or acquiring property. Article 40 also states that property is immune from invasion, that no person shall be forbidden from acquiring and making use of a property except within the limits of law, and that no one’s property shall be confiscated without the provisions of law and the order of an authorized court. The Afghan Civil Code recognizes a woman’s right to own and sell property. A woman can sell her property out of her own free will and she can donate it if she chooses to do so. A woman may obtain property through marriage, inheritance or purchase with her own income. The Civil Code also defines the inheritance rights of women and girls with respect to the Islamic Shari’a. Islamic Law recognizes and protects three kinds of property: the first is acquired through either inheritance or labor; the second, directs compliance with the women’s rights as articulated under the law; and the third outlines the women’s ownership of property, including land. Islamic law grants widows one-eighth of the property of the deceased spouse, and daughters inherit half the share of land inherited by sons (Human Rights Watch 2017; GIRoA 2004; GIRoA 1977). Despite these formal provisions and customary provisions, de facto realization of ownership rights is limiting women’s access to their legal right to property. Daughters tend to relinquish their inherited land rights to their brothers, especially at marriage, because their husbands are the main providers of the family. Widows who inherit land commonly transfer it to their sons. In the rare cases where women do retain control of inherited land, it is usually because they have no brothers and are not married, and thus must keep the land to support themselves. The structural issues underpinning lack of land access and land tenure insecurity include: illiteracy; low female employment; a weak and ineffective judicial system to enforce helpful land laws; absence of awareness of laws; lack of physical access to legal documents; and prohibitive law enforcement mechanisms (Akbar and Pirzhad 2011; ECW 2014). However, in 2016 as part of a new initiative to increase security of tenure in Kabul, ARAZI, with donor support from USAID and technical support from UN Habitat, developed a program to gradually upgrade land and property rights of urban households through the issuance of occupancy certificates. For the first time, occupancy certificates have been issued to women only, and women as joint owners along with their spouses, in order to recognize and regularize the various forms of tenure that exist outside the formal register among urban poor communities, including in informal settlements, in Kabul city (UN Habitat 2016). Land administration in Afghanistan is complex, involving many formal (statutory) institutions and governance structures, as well a variety of informal (non-statutory) institutions especially those that are involved in the resolution of land issues and disputes. The Afghanistan Government has been engaged in land administration, primarily as a means of collecting taxes, since the early 1900s. The institutional structure has changed throughout those hundred plus years. Primary responsibility for land administration now falls with ARAZI. ARAZI is vested with authority in the following specific areas: (1) state-owned land inventory; (2) state land registration through the land rights identification process (Tasfiya); (3) land registration through the cadastral survey process (land survey); (4) land transfers and exchanges, primarily to other government divisions; (5) leasing land to the private sector; and (6) resolving disputes involving state and public lands. In practice, ARAZI keeps records with respect to all land, both public and state, including maps, surveys, ownership records and land transactions, although this process is not yet complete (GIRoA 2008, ARAZI 2014). ARAZI engages in state land management at the provincial and district levels through Settlement Commissions set up at provincial capitals throughout Afghanistan. The commissions address land ownership issues between individuals and the government and between the government and government entities. In addition, the commissions make recommendations regarding state land distributions to private individuals. Their specific obligations and powers include, among others: settlement of landholding areas; distribution of documents and land; determining the categories, water rights and taxation of land; determining and segregating lands as individual or state, as well as their classification such as grazing, arid, jungle lands; and restoration of previously illegally distributed land to the owner or legal heirs. The Cadastral Survey Office, formerly the independent Office of the General Geodesy and Cartography, merged with ARAZI in 2013 and specifies the territory, map and measurements of a piece of land (GIRoA 2008; UNAMA 2014). ARAZI does not manage urban land and townships. Municipal land is controlled and managed by local governance officials under the management of the Independent Directorate for Local Governance (IDLG), and the Ministry of Urban Development and Housing (MUDH) is responsible for developing master urban plans and policies and supporting the revenue and capacity building programs of municipalities, including infrastructure and services, sanitation and preservation of historic areas. MUDH issues and updates these plans and is involved in policy and decision making relevant to informal settlements and services within the municipalities (GIRoA 2017). In terms of dispute resolution, several courts and offices within them are legally responsible for resolving land disputes and issuing, registering and storing titles. The relevant courts include the public rights courts, civil courts, personal status courts and commercial courts. The Office of the Directorates of Documents and Deeds Registration, which encompasses Protected Document Registry and Court Archives, is located within the appellate courts at the provincial level and issues and maintains title deeds. Estimates indicate that over 60 percent of all cases brought to a shura or jirga involve a land dispute. Village councils (shura or jirga) are active in local matters, including land issues and disputes. The shura system is sometimes criticized as representing the majority political factions and elites at the expense of economically disadvantaged and vulnerable groups. Women are not permitted to be members of the shura (GIRoA 2011; Dempsey and Coburn 2010; Coburn 2011). In general, the current institutional framework for land management and administration is not considered inclusive or pro-poor, despite government efforts. Outdated systems, overlapping responsibilities, lack of capacity at local levels, conflicting systems for land ownership and uncertain or incomplete legal frameworks, compounded by decades of conflict and widespread displacement have resulted result in competing claims to land and conflicts between individuals, among communities and between citizens and the state (Unger et al 2016; World Bank 2016). Urban-based economic activity now accounts for over 50 percent of GDP in Afghanistan, yet the urbanization process has been largely informal. It is estimated that 70 percent of urban property is unregistered. Still, the land market is a key source of municipal revenues. Sale of municipal land and properties is the largest revenue source, contributing an average of 22 percent of total annual revenues in Kabul and 19 percent in thirty-three cities throughout the country. Land leases account for an average of 13 percent of revenues, followed by seven percent for property leases. The process for selling land was streamlined by the government in 2009 to encourage formal registration of land transactions. The number of steps required was reduced, as were the taxes due at the time of sale. While these changes improve and simplify the conveyance process, and some increase has been seen in the number of transactions, registered titles can be subject to attack by others claiming superior rights in land. Anecdotally many land sales occur informally, making land transactions highly vulnerable to corruption and constraining legitimate development opportunities in the future for municipalities. At the same time there is sufficient land to accommodate housing and development. Municipalities possess on average 27 percent vacant plots (land subdivided but not yet occupied) in built up areas, reflecting land sales by municipalities and private sector speculation. These vacant plots are sufficient to accommodate another 4 million people at current densities, adequate for urban growth in the coming 10 years (EMG 2010; GIHCD 2012; GIRoA 2015b). The rural land market is constrained by a dearth of arable land, insecurity, land disputes, landmines left from wars and infighting and limited irrigated land. Most land is transacted by informal deeds, relying on oral history and community knowledge for identification and using witnesses for authentication of identity and enforceability of rights (Shirzai 2016). Under Article 40 of the Constitution, the government may take private property if: (1) it is “for the sake of public interests”; (2) the government provides the owner with “prior and just compensation”; and (3) the government obtains an order from an “authoritative court.” The Law on Land Expropriation of 2000 (amended in 2005 and 2010), administered through the Council of Ministers, recognizes private property and provides for acquisition of private land for public purposes. Public purposes may include but are not limited to: construction of manufacturing institutions; highways; railways; pipelines; extension of communication lines; power transmission cables; sewerage canalization; water supply network; religious mosques and schools; implementation of urban plans and other public welfare entities; mining and extraction from underground reservoirs; lands with cultural or scientific importance; cultivatable lands, vast gardens and major vineyards that have economic importance; and lands [planned] for dams. Other lands may be expropriated in exceptional circumstances upon the approval of the Council of Ministers. The Law states that expropriation should be done with great care and by the competent authorities and compensation for all other assets e.g., structures, crops, trees etc., on the land should be paid based on market rate. But the law does not specifically provide for resettlement and rehabilitation including provision of additional assistance to eligible affected families, restoration of business/income loss or other assistance/rehabilitation measures (GIRoA 2004; GIRoA 1977; GIRoA 2000; Gaston and Dang 2015). The 2008 Law on Managing Land Affairs relates to expropriation in that it addresses how private property is defined, how private properties are identified and formalized, how the government may lease lands to investors or allocate it to landless persons and how state power over land holding is vested. Compulsory acquisition is covered in Articles 21-22 of Chapter Three and reinforces that the right to buy private land for a public purpose is a normal state right (UNAMA 2014; GIRoA 2008; ADB 2014). Because customary ownership and long-standing communal ownership or usage rights are not recognized in expropriation law, vulnerable groups in rural and urban areas, especially the landless or those living in informal developments, are not protected through any compensatory mechanisms under formal law. Proposed revisions to the Law on Managing Land Affairs and Law on Land Expropriation will broaden the power and scope of ARAZI to tighten and limit the definition of what constitutes public purpose, which are not provided in either of the laws’ revisions. Current proposed revisions to the law include accepting customary documents as ownership documents. The Law on Land Expropriation proposes provisions for just, fair and market value compensation, public consultation and public hearings. Land advocacy groups call for any revisions to laws relating to expropriation to be more explicitly pro-poor (Wiley, 2012; ARAZI 2012; ARAZI 2014). The Government of Afghanistan recognizes that the development and stability of the country depend to a large extent on the efficient use of its land resources, in both rural and urban areas. Since 2001 it has sought, in theory, to implement a system of modern land administration and governance by pursuing: policy, legal and regulatory reform; international good land practices; institutional development; and increased decentralization of land matters to the village level. In terms of policy, the objectives of 2007 National Land Policy are to: provide every Afghan with access to land; promote and ensure a secure land tenure system; encourage the optimal use of land resources; establish an efficient system of land administration; and ensure that land markets are efficient, equitable, environmentally sound and sustainable to improve productivity and alleviate poverty. The 2008 Law on Managing Land Affairs covers such fundamental subjects as: how private property is defined, identified and formalized in legal ways; how the government may lease lands to investors or allocate it to landless persons; and how state power over land holding is vested. The Law has been criticized for instituting a strong bias towards owners with documentation, despite estimates that up to 90 percent of Afghans have no documentation over their holdings. In an effort to protect the property rights of the vast majority of land owners, holders and users, current proposed amendments to the Law seek to protect private property rights, as opposed to state property rights only, by accepting customary documents as ownership documents. Additionally, proposed changes to the Land Expropriation Law (LEL) of 2005 vis-a-vis the draft Land Acquisition Law, currently under review by the Ministry of Justice: proposes more concrete categories of public projects with examples for each as compared to LEL 2005; proposes a third party monitoring body, which can assess whether the leased and transferred land is used for their destined purposes; and requires the organization developing a public interest project to estimate the least amount of land required for it (ARAZI 2014; ARAZI 2014; Alden Wiley 2012). In one of the most centralized governance systems in the world, efforts to decentralize land governance and ensure it is responsive to local realties on the ground are, in part, evidenced by the establishment of an independent ARAZI in 2010 to provide a balanced approach between (a) pro-poor land administration services in support of individual and collective tenure security through land registration, and (b) land allocation and the provision of land to support private sector investment in infrastructure, natural resources, agriculture and industry. Most recently, ARAZI has further broadened its scope and authority through application of the Land Governance Assessment Framework (ARAZI 2014; ARAZI 2014b; Alden Wiley 2012; World Bank 2014; Nezam 2017). Despite these legal and policy advances, serious practical challenges remain to administering and managing land in Afghanistan. Land grabbing, or “land usurpation,” and concomitant informal development in both the urban and rural sectors by returnees, armed actors and powerful elites, remain largely unaddressed. In response, ARAZI has identified 18,000 illegal land grabbers and is developing a plan to return these confiscated lands to their rightful owners. At the same time, returnees from neighboring countries continue, with more than half a million crossing from Pakistan alone after decades out of the country. Due to continued insecurity and land usurpation, many are seeking homes in urban areas, but land speculation has driven land and rent prices out of reach for these vulnerable populations. At least one factor in rural insecurity is an increase in opium production both in terms of areas under cultivation and the geographic spread of growing areas. The total area under opium poppy cultivation in Afghanistan has increased by 10 percent in 2016, while less than 14 percent of the country’s provinces were reported to be free of poppy cultivation. While the Karzai government made opium poppy cultivation and trafficking illegal in 2002, many farmers, driven by poverty, continue to cultivate opium poppy to provide for their families. (Nahid and Dowy 2017; Muzhary 2017). Urban development is also on the governmental agenda presently and in the coming decades, as urbanization has been recognized as one of the most significant drivers of change—and opportunities for change. The Afghanistan National Peace and Development Framework (ANPDF) sets out the overall perspective for the coming five years, including the new emphasis on urban development. The Urban National Priority Program (U-NPP) frames subsequent policies and legislative action required under the ANPDF. The Vision Statement from the U-NPP strives for a network of dynamic, safe, livable urban centers that are hubs of economic growth and arenas of culture and social inclusion through decentralized urban planning and participatory urban governance by 2024. As regards land, the program recognizes that tenure insecurity, land grabbing and usurpation, uncontrolled planning and informality are the norm (GIRoA 2017c; GIRoA 2016c, AREU 2017b). Over the past decade the World Bank has provided support in the land sector, the most recent of which has been the completion of The Land Governance Assessment Framework (LGAF) in Afghanistan. The LGAF, developed by the World Bank in partnership with the Food and Agriculture Organization, International Fund for Agricultural Development, International Food Policy Research Institute, United Nations Human Settlements Programme (UN Habitat), the African Union and numerous bilateral partners, is a diagnostic tool to assess the status of land governance at the country level using a participatory process that systematically draws on existing evidence and local expertise as opposed to the knowledge of outsiders (AREU 2017). The European Union is funding the Strengthening Afghanistan Institutions’ Capacity for the Assessment of Agriculture Production and Scenario Development project 2017-2020. The project will establish a Land Resources Information Management System to guide policy-makers in developing appropriate policiesand plans for various land uses (especially agriculture) and providing location-specific adaptation options. The project also aims to develop the monitoring and analyzing systems of land resources and to study the proportionate specifications of land against the environmental risks at the local and national levels (United Nations 2017). Land and dispute resolution has become a focus on recent donor efforts. USAID and the United States Institute for Peace (USIP) Strengthening Peace Building, Conflict Resolution and Governance in Afghanistan Project 2015-2020 was established to support peacebuilding efforts in Afghanistan through policy research, provision of grants to Afghan civil society organizations and technical assistance to strengthen the legitimacy of Afghan government institutions. A component of this project is to work with ARAZI to develop a land registration process and support Afghan government institutions to build dispute resolution mechanisms, including a pilot system to register land disputes resolved through tribal customary law (USAID 2016; Gaston and Dang 2015). Agriculture is one of the country’s main economic drivers with estimates that up to 80 percent of its people derive their livelihoods from the sector. Despite its importance, water scarcity and decayed infrastructure systems remain key challenges for the country, even with relatively abundant of water resources. Afghanistan lies within the heart of one of one of the region’s largest freshwater regions, the Hindu Kush Himalayan regions. Its major river systems are the Amu Darya, the Helmand, the Harirud and the Kabul. Only the Kabul River, joining the Indus system in Pakistan, leads to the sea. All four rivers cross international boundaries. These water resources are unequally distributed. The Amu Darya Basin, including the Harirud and Murghab Basin and non-drainage areas, covers about 37 percent of Afghanistan’s territory and contains about 60 percent of the water flow. It is one of the longest rivers in Central Asia and forms part of the country’s borders with Tajikistan, Uzbekistan and Turkmenistan. The Harirud-Murghab represents about 12 percent of Afghanistan’s water resources and is centered in Herat, an intensely irrigated region of Afghanistan. The river flows through Iran, ending in Turkmenistan, and acts as a border between Afghanistan and Iran and further between Iran and Turkmenistan. The Helmand River Basin forms the Afghan-Iranian border for 55 kilometers and water is used primarily for irrigation. The Kabul River flows through Afghanistan and Pakistan and represents approximately 26 percent of the available water resources in Afghanistan. Annual precipitation is robust at 165,000 million cubic meters and there is adequate water flow due headwaters in its high mountains (Reigart and Wegerich 2010; Schroeder and Ure 2015; Yildiz 2017). The country, however, lacks the capacity to store, use and manage those water flows and ranks among the weakest in the world in storage capacity. Drinking water supply and water for irrigation is the priority for the Afghanistan government, but the challenge of obtaining safe and reliable supplies of water in Afghanistan is heightened by the fact that water-resources data collection was suspended around 1980 due to war, conflict and the Soviet invasion. Subsequently, much of the institutional knowledge relating to water resources was lost and most of the country’s water monitoring equipment was destroyed, resulting in a dearth of technical capacity, infrastructure and modern equipment necessary for effective hydro-geologic investigation of potential water resources. Meanwhile, scientists estimate that the need for water in the Kabul Basin will increase by six-fold over the next 50 years, as levels of available water decline due to increasing temperatures and climate change. Only 27 percent of the country’s population has access to improved water sources and it goes down to 20 percent in rural areas, which is among the lowest percentage in the world. The percentage of people with access to improved sanitation facilities is at 5 percent nationwide and only 1 percent in rural areas. In Kabul, 80 percent of the people lack access to safe drinking water and 95 percent lack access to improved sanitation facilities (Yildiz 2017; Hessami2017; Duran 2015). Only 10 percent of agricultural land is irrigated, with remaining cultivated lands utilizing traditional methods such as deep-water wells, which are compromising aquifers and groundwater resources. Population growth, urban expansion, more intensive agriculture and prospective mining operations and climate change will further stress existing water resources (United Nations 2016). The legal framework for water is embedded within the Constitution, statutory Law, Islamic law and customary law. The Preamble to Afghanistan’s Constitution broadly states that its goal is to achieve a “prosperous life and sound living environment” for all citizens. Article 9 reflects the importance of sound management of natural resources, including water. These general constitutional guarantees are more particularly defined in Afghanistan’s statutory law and in particular the Civil Code and Water Law. The Civil Code mandates that water from rivers and their tributaries are public property. All people have the right to use water to irrigate or draw on a stream for irrigation of private lands, including for irrigation of crops and trees, so long as the usage is not “contrary to public interests special laws.” The Water Law of 2009 enforces the protections afforded by Article 9 of the Constitution through regulations aimed at promoting conservation, equitable distribution and efficient use of water. The Law reaffirms that water is public property and the government holds management authority over the resource. Water is free, although costs of investment and provision of services can be charged by service providers. The Water Law states that suitable water-use traditions and customs will be considered in fulfilling the rights of water users, adopts an integrated water resources management approach based on a transition towards river basin development, and contains a strong role for local stakeholder participation. Finally, the Water Law mandates that the Ministry of Energy and Water (MOEW) coordinate transboundary water issues (GIRoA 2004; GIRoA 1977; GIRoA 2009). Both the Constitution and the Water Law provide that no law shall contravene the tenets and provisions of the holy religion of Islam in Afghanistan and that the rights of water users, including rights-of-way for water resources, shall be interpreted in accordance with the principles of Islamic jurisprudence respectively. Classical Islamic law treats water as being held in public trust and private ownership of water rights is generally forbidden. Islamic law prohibits a person from withholding or misusing water by polluting or degrading it. Finally, customary law prevails as the practical legal framework for water, although there is no single set of rules under customary law or traditional practices that have been codified. In general, customary law governs water use, resolution of water conflicts and water resource conservation. Control of water distribution in most villages remains largely in the hands of local mirab bashis or mirabs and through the kareez system. A kareez is an underground system that taps and channels groundwater for the purposes of irrigation and domestic supply (GIRoA 2004; GIRoA 1977; GIRoA 2009; Wegerich 2009; Khan 2013; Afghanistan Legal Project 2015). The Water Law is intended to include the traditional structures while gradually transitioning to a more modern integrated approach to water resource management. Specifically, the permitting system envisioned by the Water Law is intended to promote a more coherent and coordinated system for regulating Afghanistan’s limited water resources. Implementation of the law, however, is incomplete and gaps in the existing regulatory system persist, resulting in disputes and even violence among individuals and entire communities (Wegerich 2010; UN 2016). Both the 2008 Water Sector Strategy and the 2009 Water Law, which recognize both Islamic and customary law, articulate that water is public property managed by the government. The Civil Code of Afghanistan further states that rivers and tributaries are public property and every person can irrigate lands from that water, except where it is contrary to public interest or special laws. To better regulate water usage, the Water Law allows the use of water without a permit in the following circumstances: for drinking water, livelihood and other needs, provided the daily consumption does not exceed 5 cubic meters per household; navigational uses, provided no damage occurs to the banks and right-of-way area of the river and there is no adverse impact to the quality of water exceeding permissible norms; and fire extinguishing. The following uses or activities require approval of a permit or license issued by River Basin Agencies prior to undertaking: surface or groundwater use for newly-established development projects; disposal of wastewater into water resources; disposal of drainage water into water resources; use of water for commercial or industrial purposes; use of natural springs with mineral contents or hot springs for commercial purposes; digging and installation of shallow and deep wells for commercial, agricultural, industrial and urban water supply; construction of dams and other structures for impounding water when the storage capacity exceeds 10,000 cubic meters; and construction of structures that encroach banks, beds, courses or protected rights-of-way of streams, wetlands, kareezes and springs. Once a permit or license is issued a River Basin Agency may cancel or modify a permit if the water user, without justification, fails to utilize or over utilizes the amount of water that has been allocated to the user. River Basin Agencies may also cancel or modify a license or permit when adequate water is not available to support the use or national interests demand (GIRoA 2009; GIRoA 2008c; Afghanistan Legal Project 2015; United Nations 2016). In terms of irrigation, a person who builds an irrigation canal on his own property has the right to use it any way he wishes and can exclude others unless they secure the owner’s permission. In terms of access of rights to public water for irrigation, by law, the distribution of water rights deriving from public streams should be determined proportional to each land’s need for irrigation through Irrigation Associations (IAs). IA’s can delegate responsibility for distribution of water within irrigation networks in designated areas to the registered IAs. Linkage between these new associations and the traditional management of irrigation systems is made under the Water Law, which allows IAs to delegate the management and responsibility of water rights to a mirab bashi or mirabs designated by the IAs (World Bank 2016b; United Nations 2016; Thomas et al 2012). While it is mostly women who collect water for household use, cooking, family hygiene and even farming, women are often excluded from government decisions and have little influence on the major decisions on how this critical resource is governed, be it at the local, national or trans-boundary levels. The gap between water managers and women is beginning to be bridged by educating women so that they are encouraged to get involved in technical and managerial roles relating to water management (OSCE 2016). The institutional framework for water management has two levels; the first level is the community-based system for water allocation, which is based on traditional methods and customary law. Traditionally, water resources are governed at the village level. Water is distributed according to local tradition and agreements between farmers, the mirab and local government. Village elders customarily handle water disputes, applying customary law. It is important to note that in some areas military commanders have taken control of water resources, effectively replacing the mirab. The second level is a national water administration effort, which is rooted in the 2008 Water Sector Strategy and enacted through the 2009 Water Law. The primary responsibility for oversight of water distribution systems is through the Ministry of Energy and Water (MEW). It creates water distribution plans, gathers data, prepares weather forecasts, maintains power operation and storage systems, engineers new irrigation systems, issues water usage licenses and mediates water disputes. It also establishes and oversees River Basin Agencies, Sub- Basin Councils and local Water User Associations. At the national level, the MEW is responsible for planning, management and development of water resources. The Ministry of Mines and Petroleum (MoMP), Ministry of Public Health and National Environmental Protection Agency (NEPA) are mandated to assess and protect groundwater reserves, while protection of surface water is shared among several ministries including NEPA, the Ministry of Agriculture, Irrigation and Livestock (MAIL), MEW, Ministry of Urban Development, Ministry of Public Health, and MoMP. Irrigation is governed by MAIL and MEW. Provision of water supply for drinking and livelihood in urban areas falls under the Ministry of Urban Development, MEW, the Ministry of Public Health, and MAIL. Rural water supplies are within the jurisdictions of the Ministry of Rural Rehabilitation and Development, MEW, MoMP, Ministry of Public Health, MAIL, and NEPA. MEW, Ministry of Foreign Affairs, Ministry of Interior, and Ministry of Border and Tribal Affairs manage international water boundaries (United Nations 2016; Thomas et al 2012). At the subnational level, River Basin Agencies and Sub-Basin Councils seek to promote the involvement and participation of local water users and other relevant stakeholders in the decision-making process. These agencies and councils have the responsibility in their respective basins to: determine water allocations in accordance with national water policy; manage and monitor the right to use water; establish criteria to evaluate, adjust and deny water use permits; and issue, modify and cancel water use permits. Sub-basin Councils are composed of members representing local “water users, relevant government institutions, and other relevant stakeholders.” The Sub-Basin Councils have dispute resolution powers but no authority to issue or modify water use permits. The decisions and activities of the Sub-Basin Councils are subject to review and supervision by the relevant River Basin Agency. Finally, MAIL can delegate responsibility for the distribution of water within the irrigation networks (i.e., canals) in designated areas to the registered Irrigation Associations (IA). Article 11(5) Article 23 of the Water Law links these IA’s with the traditional management of irrigation systems by allowing IA’s to delegate management and responsibility of water rights to a mirab bashi or mirab designated by the IA (GIRoA 2009; United Nations 2016). Although the national system for water management has been laid out in theory, actual implementation remains incomplete and challenging due to lack of human and financial resources, data, adequate infrastructure in many areas and a clear plan for coordinating its efforts. The national effort tries to create a method for governing the higher level of water distribution through sub-basins and river basins, but integrating these two systems is also incomplete. Still, the Water Law recognizes the prevalence of community-based systems and the role of custom in water management and tries to incorporate these systems into its vision for change (Afghanistan Legal Project 2015). The Government’s priorities for national development recognize the crucial role water plays in Afghanistan’s future economic growth and the well-being of its people. The Government has taken important steps in improving water management. It has acknowledged that access to water is a right of the people and the Afghanistan National Development Strategy (ANDS) identifies water infrastructure as one of the key priorities. Other interventions include: the 2008 Strategic Policy Framework for the Water Sector; the 2009 Water Law; regulations governing water use and irrigation in ways that respect Islamic and customary law; charter and internal regulations for Water User and Irrigation Associations; the division of functions among Ministries; and the legal and policy functions of River Basin Councils. While the Water Law (2009) adopts an Integrated Water Resources Management (IWRM) approach together with a River Basin Management (RBM) approach as core principles for land and water management, buy-in of local and national actors in the new water governance concepts is mixed (GIRoA 2008; GIRoA 2008b; GIRoA 2009; Kakar and Thomas 2012). The World Bank’s Irrigation Restoration and Development Project (IRDP) 2011–2020 has as its objective to increase agriculture productivity and production through: rehabilitation of irrigation systems covering about 300 hectares of irrigated areas; design of multi-purpose small dams and associated irrigation and distribution systems in closed river basins; establishment of hydro-meteorological facilities and services; technical assistance in project management; and capacity building for the Ministry of Energy and Water and communities (World Bank 2017). USAID is currently project aims Rural Water, Sanitation and Hygiene Program 2016–2020. The partnered with the United Nations Children’s Fund to work with the Afghan Government and with civil society on the to strengthen the quality of water, sanitation and hygiene services in households, schools and health facilities. The water component of the project is working to increase access to drinking water services and increase the sustainability of water supply systems. Activities include: expanding access to an improved drinking water supply for children in about 200 primary schools or community-based learning centers; supporting operation, maintenance, servicing and management of small-scale rural community water supplies through private enterprises or associations; and introducing solar powered water pumps and gravity-fed water systems (USAID 2016). USAID’s Strengthening Watershed and Irrigation Management (SWIM) program 2016-2021 supports sustainable, agriculture-led economic growth by: increasing the sustainable and productive use of water; and strengthening water resource management by improving the water regulatory environment and local entities’ ability to manage water resources. In support of the main objectives, SWIM will: rehabilitate irrigation infrastructure and restore degraded watersheds; support collaboration between governing bodies for irrigation and water management; strengthen the capacity of water resource and irrigation training programs; improve public outreach and technical and administrative capacity to resolve conflicts through community-based natural resource management. At the national level, SWIM supports the Government of the Islamic Republic of Afghanistan to strengthen water resource management capacity (USAID 2017). Afghanistan’s forest area comprises 2.1 percent of total land area. Forest types include evergreen coniferous forests covering approximately 1.3 m hectares of land, the largest collections of which are located in Dewagal Valley, Kunar, Nuristan, Paktia, Khost and Paktica Provinces. Evergreen fleecy leaf forests are found extensively throughout the country. Broad leaved deciduous forests and other broad-leaved forests are found scattered throughout the country. Man-made forests, mostly poplar and willow, comprise 70,000 hectares of land. The government has recognized four natural sites as areas requiring special attention—Band-e-Amir National Park, Big Pamir Wildlife Reserve, Teggermansu Wildlife Reserve and the Wakhan Conservation Area. In 2009, the country’s first national park, Band-e-Amir, was established. To have an impact on biodiversity, the size of protected area size will need to be increased and measures put in place to ensure sustainability (Cropwatch, ND; World Bank 2015; UNDP 2017). Forests provide households with wood for fuel and construction, land for cultivation and grazing livestock, and forest products such as nuts, tubers, fodder and fibers. Timber is in high demand on the international market and in neighboring Pakistan. Although commercial timber harvesting is illegal in Afghanistan, a systematic smuggling industry exists. Poverty, insecurity, lack of alternative fuel and a lack of Special Forces to protect Afghan forests are among the main reasons for the illegal cutting of forests in the country and smuggling them abroad. Additionally, wild pistachio forests, once common in northern Afghanistan and a key source of income along the “pistachio belt” that runs from Badakhshan in northeast Afghanistan to Kunduz in the north and Herat in the west have been in decline. Known as “green gold” due to its market value when allowed to mature, these trees have been looted by the Taliban to fund their activities. Once covering about 450,000 hectares of land, it is estimated 40 to 50 percent of the trees have been destroyed, have been killed by drought or overharvested and looted by the Taliban (Dawn News 2016; Jasper 2016; Carberry and Faizy 2013). While decades of conflict and uncontrolled logging have decimated Afghanistan’s forests, agriculture, urban encroachment and ineffective forest management have also resulted in deforestation. Exact current data is not available, but between 1990 and 2000, Afghanistan lost an average of 29,400 hectares of forest per year, at an average annual deforestation rate of 2.25 per cent, which further increased to 2.92% per annum between 2000 to 2005. According to the GIRoA in documents submitted to the 2015 of forest per year, at an average annual deforestation rate of 2.25 per cent, which further increased to United Nations conference on climate change that in Paris, once tree cover moves below 15 percent it is impossible to prevent topsoil erosion and maintain air quality: in Afghanistan tree coverage has declinedto 3 percent. If current trends continue, all forests are likely to disappear in the next 30 years. The implications for deforestation and severe climate change are grave: drought is likely to be regarded as the norm by 2030, rather than as a temporary or cyclical event. Additionally, Afghanistan is part of a region that stands out for having the second-highest rate of rising temperatures and is expected to have a net loss of annual precipitation. According to Afghanistan’s Initial National Communication for Paris, the country’s mean annual temperature is projected to increase by 1.4 to 4.0°C by the 2060s, and 2.0 to 6.2°C by the 2090s (UNDP 2017; Ruttig and Stake 2015; IPCC 2014). The statutory legal framework for the forestry sector includes the Constitution, the Forestry Law of 2012 and the Environmental Law adopted in 2007. The Constitution obligates that the Government take measures necessary to protect and improve the country’s forest resources. The Forestry Law of 2012 as well as the Constitution emphasizes the importance of community-based natural resources management. The former legislation is founded on community-based management principles and echoes the National Development Strategy, which identified developing community-based management of forests as a desired method to promote sustainable management and prevention of conflict. Presidential Decree on Fighting Against Corruption 2012 mandates taking appropriate measures to protect forests, especially the development and conservation of pistachio and pine trees. The Environmental Law of 2007 calls for: the sustainable use, rehabilitation and conservation of biological diversity, forests, rangelands and other natural resources; prevention and control of pollution; and conservation and rehabilitation of the environment from adverse effects. It also codifies customary rights to legally access and use forest in accordance with customary traditions and practices that encourage community-based sustainable natural resource management. Local communities based in or adjacent to forests commonly depend on the forest resources for their livelihoods. Under customary law, local communities have rights to access forest lands and use forest resources (GIROA 2004; ICMOD 2015; GIROA 2007; GIROA 2012; United Nations Forum on Forests 2012). Under both statutory and customary law, the tenure and user rights of local communities over publicly- owned forests recognize that every person has the right to 1) legally use natural resources in accordance with customary traditions and practices which encourage community-based sustainable natural resource management, 2) create and legally register civil society organizations which advocate or sustainable management of natural resources and conservation and rehabilitation of the environment, and 3) recognize user rights of local communities over publicly-owned forests (United Nations Forum on Forests 2012; GIRoA 2007). However, extra-legal activities by local elites, warlords and political factions have resulted in their de facto control over forests and access and resources. For example, in 2016 pistachio harvests declined by an estimate 50 percent when forests were looted by the Taliban and armed locals prior to harvesting time. Instability in access, use and sustainability practices, under both customary and statutory law, has led to declines in yields for legitimate livelihoods and destruction of trees. Local residents who can collect enough pistachios to earn around 1,000 to 2,000 Afghanis (15 to 30 USD) per day—enough to feed a family for a week have been affected by illegal harvesting practices. (Shimizu and Trudel 2006; Dawn 2016). The Department of Forestry and Range Management in the Ministry of Agriculture, Irrigation and Livestock (MAIL) is responsible for managing the country’s forestlands. The Department is responsible for the management and protection of the country’s natural forests, pastures, national parks and wildlife resources. The National Environmental Protection Agency (NEPA) was established 2005 as an independent national institution and serves as Afghanistan’s environmental policymaking and regulatory institution. Per the Environmental Law, NEPA is mandated, among other things, to: maintain environmental integrity and promote the sustainable use of natural resources; promote conservation and rehabilitation of the environment; coordinate environmental affairs at the local, national and international levels; and develop and implement national environmental policies and strategies in order to integrate environmental issues and sustainable development approaches into the legal and regulatory frameworks. NEPA is also charged with promoting public awareness on environmental issues, the impacts of climate change, mitigation of greenhouse gases, and adaption approaches (GIRoA 2009; WeAdapt 2017). The Afghan government has an ambitious plan to increase the proportion of forests from two percent to 10 percent of the country’s land area by 2017. However, institutions lack the resources, outreach and staff capacity to enforce anti-logging legislation in most parts of the country. Illegal logging, combined with limited understanding of the value of biodiversity, remains the most immediate threat to forests and the livelihoods of those who depend on them. In 2016, MAIL began implementation of the Kabul Greenbelt Project. Over the next decade, the project aims to create more than 10,000 hectares of green space around Kabul, including 4,000 hectares of forested area. Five hundred hectares are planned for greening in the Asmai and Shi Darwaza mountains, Qargha and near the Kabul airport with saplings and seeds chosen for their drought-resistant properties (UNDP 2017; GIRoA 2016). The Global Environment Facility Small Grants Programme 2012-2018 is funding small grants to local communities in Badakhshan, Bamyan, Kabul and Nangarhar to enable projects focused on biodiversity, climate change, land degradation and sustainable forest management (UNDP 2017c). UNDP is also funding efforts by Wildlife Conservation Society, NEPA, and MAIL between 2014-2018 to manage and expand protected areas in Afghanistan. To that end, UNDP is supporting the establishment of Afghanistan’s Parks and Wildlife Authority that will create a legal, policy and institutional framework for protected area management. This new Authority will be granted clearly defined legal powers, such as recruiting personnel, creating budgets, securing funds and providing a quick response to local conditions, including entering into contracts with communities and private sector partners for park development (UNDP 2017b). Although Afghanistan has abundant mineral resources, most have not been successfully explored or developed. The most recent and modern sector analyses were undertaken through joint geologic activities from 2009 to 2011 between the U.S. Geological Survey (USGS), the U.S. Department of Defense Task Force for Business and Stability Operations (TFBSO), the then Ministry of Mines, which is now the Ministry of Mines and Petroleum (MoMP), and Afghanistan Geological Survey (AGS). The country possesses a wide range of mineral resources, including: base and precious metals; construction minerals; nonmetallic minerals; oil and gas; precious and semiprecious stones; and rare-earth elements. Critical industrial metals such as lithium are also present. Precise mineral production data are not readily available due to 1) numerous undocumented artisanal and small- to medium-scale mining operations throughout Afghanistan and 2) limited access to the mines to verify reported data because of the security situation. In general, large-scale mining is undertaken for chromium, copper, gold, iron, steel, iron and marble. Mineral resources as chromite, coal, gypsum, lime, marble, natural gas, salt and talc continue to be exploited through artisanal and small- to medium-scale mining (Choi 2014; GIRoA 2012; Peters et al. 2013; USGS 2013). Untapped mineral resources are estimated to be worth more than 1 trillion US dollars, though the figure is disputed to be either higher or lower, depending upon the source. The potential for at least 24 world-class mineral deposits have been identified as “Areas of Interest,” which represent both the mineral and its geographic location. For example, these areas include Badakshan (gold), Balkhab (copper), Haji-Gak (iron), Northern Aynak (copper, cobalt and chromite), Zarkashan (copper and gold), Kundalan (copper and gold), Khanneshin (carbonatite) and Dusar-Shaida (copper and tin). Mineral resources in general are located along two corridors: The first runs from Herat in the far west to Badakhshan in the northeast and contains significant deposits of iron, gold, copper, barite, coal and gemstones. The second corridor, the southern extension of the Tethyan Eurasian Mineral Belt (TEMB), covers a thin strip of southern Afghanistan and extends north-east through Helmand, Kandahar, Zabol and Ghazni provinces. This belt contains numerous copper, gold, molybdenum, zinc, lead and chromite deposits. Many mineral resources are also located near the north-east border of Pakistan (The Telegraph, 2010; World Bank 2016; GIRoA 2012). The Afghan Ministry of Mines and Petroleum has indicated that the annual income through mining could reach as high 3.5 billion USD, covering 77 percent of the total core budget of the Afghan government. However, despite the potential in the sector, it remains undeveloped due to poor access, lack of energy and water, which is needed in mining operations, and the challenges of having such a diversity of mineral resources that require different exploration approaches, mining and metallurgical techniques (Loewenstein 2014). One of the biggest challenges, however, is security. War and neglect have led to underproduction of mineral resources, unlicensed operations and smuggling, and untapped energy resources. Unexploded ordnance and land mines in mineral-producing areas have deterred development. Along the border of Pakistan, warlords and local elites have taken control of and expanded mineral operations. Thus, illegal mining is rampant throughout Afghanistan, with more than 2,000 such sites raising money for the insurgency. There is massive mineral theft by the Taliban, particularly in Logar Province. According to MoMP, many of these resources are smuggled out of the country, which is affecting the country’s economic growth and stability (Peters et al 2014; USGS 2013; World Bank 2016). In the context of declining aid, the extractives sector is the country’s primary focus to increase government revenue and to generate foreign exchange income. Public investments required to mobilize the mining sector would cost around 350 million USD per year (World Bank 2016). Under the Constitution, Afghanistan’s underground minerals belong to the State. The most recent Mineral Law, adopted in 2014, governs the ownership, control, prospecting, exploration, exploitation, extraction, marketing, sale and export of minerals on the territory of Afghanistan. Previous versions of the law have been amended many times, but these amendments have not served to stabilize the sector. Consistent with the Constitution, the Mineral Law provides that all deposits of minerals on or under Afghanistan or in its watercourses are the exclusive property of the State. A surface land interest does not include rights to minerals. The Ministry of Mines and Petroleum (MoMP) is authorized to grant mineral rights in accordance with the provisions of the law. The Mineral Law refers many key issues foresolution by other, largely undrafted regulations, thereby providing ample space for corrupt actors to abuse the system. The Income Tax Law of 2009, Environment Law and Investment Law regulate different aspects of the manning sector as well (GIRoA 2014; Paiman 2017). In principle, legal mining activities can occur only under a contract issued on behalf of the state by the MoMP. Royalties are negotiated separately for each contract and are specified in the contract, though some broad guidelines for different minerals are in place. In addition, mining enterprises, like other businesses, are required to pay tax on their profits, in accordance with the country’s income tax law. However, the Mineral Law does not clearly delineate the amount of royalties to be paid, leaving this issue to be dealt with in subsequent law. The Mineral Law and the Environment Law require mining companies to conduct a social and environment impact studies before beginning extraction. Perceived deficiencies in the legal framework have been noted, including the absence of transparency in the bidding process and allocation of licenses, enforcement of requirements and terms contracts and clear penalties for violations of the Mineral Law (GIRoA 2014; Hart Group 2017). A new set of amendments to the 2014 Law have been advocated for and proposed as of 2017. These amendments seek to stabilize and increase transparency within the sector and include: publication of project-level payment and production figures; a public register of extractive sector companies; enhanced controls on owners; provision for local employment in mining projects; mechanisms to improve community monitoring of mining projects such transparency in ownership, royalties and financial information (Integrity Watch Afghanistan 2017). Under the Mineral Law, MoMP can grant mineral rights to individuals and entities who are Afghanistan citizens or citizens of foreign countries legally entitled to reside or do business in Afghanistan. By law, high-ranking state officials, magistrates, lawyers, members of the armed forces, police and other public employees cannot hold mineral rights. In fact, mining companies that obtain contracts tend to be owned by politically connected persons, including, in many cases, members of the Afghan parliament (MPs), their family members, their associates and power holders with access to armed groups and their networks (GIRoA 2014; Bird and Noorani 2017). The Mineral Law (Article 19) provides for five types of mining licenses: the reconnaissance license, for assessment of mines; the exploration license, for digging and determining a mine’s volume; the exploitation license, for extraction (maximum of 30 years with the possibility of an extension); small-scale mining license; and the artisanal license. The last two types of licenses are issued specifically for unique classes of small mines. In principle, a transparent and competitive bidding process for exploration and exploitation licenses is articulated. Bid evaluations are based upon: technical and financial capabilities of the bidder; proposed socio-economic benefits; environmental protection; potential government revenues; and introduction of new technology. The owner of an exploration license is required to prepare an Environmental and Social Impact Report (ESIR), feasibility study and environment protection plan. Mine operators in all cases are required to submit their exploration plans to MoMP first for approval and then are expected to submit their findings and the various studies before an exploitation license is granted. Parties can lose their rights under the Mineral Law if they fail to pay license fees, fail to abide by the terms of the mineral right granted or fail to conduct exploration or extraction activities as contracted. Mining contract provisions for the most part are not observed (GIRoA 2014; Bird and Noorani 20). Despite the legal framework, it is estimated that illegal mining operations outnumber legal ones by a factor of five to six. Poor security and MoMP’s lack of capacity to monitor remote locales are two of the underlying factors. The reasons for rampant illegality are complex, but the post-2001 Afghan government has been politically penetrated by networks of power holders with their own access to the means of organized armed violence—whose members are involved in, or at least benefiting from, ongoing mineral exploitation. Thus, illegal mining operations are run by, inter alia, local residents, security agencies and provincial officials, anti-government forces and local warlords (Noorani 2015; Paiman 2017). The Ministry of Mines and Petroleum (MoMP) is responsible for functions relating to mineral exploration, licensing, development and mining. MoMP is obliged to regulate mineral activities in accordance with the 2010 Mineral Law. MoMP’s duties include: formulating and implementing policies (including promoting private-sector investment); proposing to the Council of Ministers the classification, declassification or reclassification of an area as prohibited for mineral activities; granting, transferring and canceling mineral rights; supervising mineral activities of public entities; and assessing and ensuring the collection of royalties. MoMP can engage in exploration and extraction of minerals by itself, through other public entities or in association with the private sector. The role of MoMP has changed from a mining entity to a facilitator for providing opportunities for the private sector (GIRoA 2014; Paiman 2017). MoMP has three deputy ministers and numerous departments, including Legal, Policy, Inspections, Surveying, Cadastre, Geology and Survey and Small-scale mining, among others. The Policy Department coordinates foreign assistance and contracts; the Cadastre Department determines the volume of mines, processes the contracts and collects revenue; the Inspection Department monitors and evaluates the implementation of contracts; the Legal Department develops the contracts and provides legal services; the Geology Survey Department conducts geological survey and collects mines’ information; and the Small-Scale Mining Department organizes the affairs of small mines. The Mineral Law provides for the establishment of an Inter-Ministerial Commission to monitor bidding processes, approve mining contracts, grant exemptions from surface rent and approve the royalty rate (GIRoA 2017; GIRoA 2014). The Mining Law establishes a Mining Cadastre within the MoMP. The cadastre is responsible for assessing fees for the processing of applications for mineral rights, reviewing and processing applications for mineral rights, executing the technical and environmental evaluation of applications for mineral rights, registering mineral rights granted and refused, registering rights terminated, extended or transferred, registering security interests and developing Cadastral Survey Maps. The Mining Law creates an Environmental Protection Department within MoMP for the protection of the environment in connection with mining activities. The Environmental Protection Department is responsible for the technical evaluation of mitigation and rehabilitation plans, Environmental Impact Statements and Environmental Management Plans. The Department also monitors compliance with environmental requirements and cooperates with other state agencies that are responsible for protection of the environment, the social welfare of the local populations and natural and cultural heritage The National Environment Protection Agency (NEPA) is authorized to evaluate the environmental aspects of mining contracts. If the environmental standards are not observed, NEPA has authority to reject the license and/or contract, but NEPA usually lacks the information needed to take such an action and furthermore is subject to pressure from powerful outside interests (GIRoA 2014; Paiman 2017). MoMP’s Inspection Department and Provincial Inspection Units are responsible for monitoring and inspecting the mining sector, including tracking compliance with contract terms and measuring the amount of minerals extracted. Civil-society organizations and local residents can play a valuable watchdog role as well but lack any official standing. In addition, Parliament’s oversight role is weak to nonexistent, further centralizing authority in the hands of MoMP (Hart Group 2017). In March 2017, President Ghani nominated a new Minister of Mines and Petroleum after a year-long vacancy in the position. Civil-society organizations welcomed the nomination, which they hope will lead to greater reforms, transparency and efficiency. The Government became a candidate for the Extractive Industries Transparency Initiative (EITI) in 2009. EITI is founded on principles to put natural resources to prudent use for the benefit of citizens in a transparent and accountable manner by disclosing the revenue that a State has received from the sector and the payments made by a company to the State. A candidate country for the EITI has to implement the seven requirements of EITI to become a compliant country. Afghanistan has completed the five-year cycle for implementation of the EITI, but it has still not been granted compliant status. Afghanistan has produced five reconciliation EITI reports, but most of them are deficient and have been critiqued by civil society for lacking data (Nourani and Brueckeri 2016; Hart Group 2017). USAID’s Mining Investment and Development for Afghanistan Sustainability (MIDAS) Project 2013-2017 assists the Afghan Government to responsibly develop the nation’s mining industry by improving its ability to plan, design and implement mining concessions through transparent tender processes. MIDAS’ goal is to make Afghanistan’s mining industry a key source of government revenues and expand the skilled labor force to include women playing a role in the mineral development. MIDAS guides the Afghan Government to implement legal and regulatory reforms for the industry, providing technical assistance to MoMP. Initiatives within MIDAS include assisting the Afghan Government to develop transparent bidding processes, contracting procedures to adopt and implement mining laws and regulations according to international best practices and helping MoMP develop expertise in data analysis and mineral deposit management (USAID 2016). GIZ has been active in Afghanistan’s mining sector by way of programs such as the Academic Mining Education in Afghanistan (AMEA) Project 2014-2017. The project aims to overhaul the technical content of educational courses relating to mining align them to the needs of the labor market, economy and administration so that the revenue-generating potential of the raw materials sector can be utilized to the full. In addition to technical and practical training for teaching staff, courses of direct relevance to the mining industry are being developed and integrated into the curricula. Regional partnerships are intended to facilitate academic networking with the international research and teaching community. The two-year ‘Govern4Afg’ project 2015-2017 was also launched by German and Afghan partners to establish a platform for policy dialogue on governance topics, including good mining governance. The project includes assisting the MoMP and Ministry of Finance in developing standardized accounting, reporting and auditing system will help improve governance of the natural resources and avoid loss of revenues. Finally, the Promotion of Mineral Governance Project 2013-2016 provided theoretical and practical training for the staff of the MoMP, equipping them with the necessary technical skills to identify mineral resource deposits and for the sustainable use of those resources (GIZ 2016). Historic and current attention related to conflict and violence in Afghanistan has often focused on the decades of occupation, war and internal insurgency. However, disputes over access to land and natural resources are the most common cause of violent conflict in the country and have become increasingly severe since 2001—both in terms of number and impact. Precise national statistics of the prevalence of land conflicts since the fall of the Taliban are unavailable, but studies on the topic over the last 10 years indicate that land relations are insecure, that a significant proportion of conflicts are land related, that demand for dispute-resolution mechanisms for land are increasing and that complex and intractable conflicts, many violent, are on the rise in Provinces such as Khost and Kunduz (Oxfam 2008; Wiley 2013; Warren 2014). The complexity of land conflicts is attributable to their diverse origin, form and scale. For example, it can take the form of non-violent inheritance disputes among siblings—or it can be a long-standing provincial level violent conflict between ethnic groups. It can be linked to transnational and global concerns, such aspoppy production, or the increasing effects of climate change on already scarce water resources. Over the past decade there has been some attempt to develop a more refined understanding of the types of land-related conflicts. Some research has sought to develop typologies for the most common types of conflict, which includes: (1) conflicts involving the illegal occupation of land by powerful people; (2) conflicts involving inheritance rights to private property; (3) conflicts involving the return of people to land they previously owned; (4) conflicts over private property between established villagers (not returnees, refugees or internally displaced people; and (5) conflicts involving common property resources managed through common property regimes, for instance certain pastures, forests and water for irrigation. Other research has indicated that most land conflicts are related to boundary disputes, inheritance rights, access to land and natural resources, illegal occupation of land and water disputes. Conflicts may be violent or nonviolent, short or long term, and be at varying geographical scales from plot to provincial levels. Finally, this diversity of land conflicts has been further exacerbated by externally driven illegality for natural resources, as with mining, timber and poppy and global events such as war, international trade and climate (Roe and Deschampes 2009; Brown and Blankenship 2013; Finaz 2015; UNEP 2012). Regardless of the typologies, control of and access to land is and has been central to power relations, especially in rural Afghanistan. Approximately 80 percent of the population relies on the land for their livelihoods, a large proportion of which for subsistence level. The country as a whole and its regions, provinces, cities and villages each possess a unique historical background and take a variety of forms and effects. Major conflicts1 in the country include, but are not limited to, for example, conflicts over water at the transboundary, system or basin and village levels. Central Asian states, including Uzbekistan, Tajikistan and Iran, have had limited engagement with Afghanistan over transboundary use. Conflicts over access to and distribution of water centers around Afghanistan’s irrigation systems and structural inequalities therein. The causes and effects of water conflict have a spatial dimension, that is, where they are physically located either upstream or downstream on an irrigation system and respective settlement patterns which often have an ethnic dimension in for example, the Hari Rud system in Herat. Underlying all of these water-access conflicts is the breakdown of customary practices of water distribution, which is driven by multi causal water scarcity and wider conflicts at all levels (UNEP 2017; Yildiz 2017; Pain 2013; TLO 2014). conflict related to climate change. It is increasingly seen as an antagonist of longstanding conflicts, although the question of whether and how conflict and climate change are linked is still hotly debated. In the case of Afghanistan, as conventional crops become less and less viable in some areas due to drought and desertification, rural populations will increasingly be driven to alternative livelihood options—including the production of less water-intensive poppy and, potentially, insurgency. In Afghanistan specifically, some studies have linked reduced rainfall or irrigation flows in some areas with increased poppy production —which could in turn have helped finance and fuel the insurgency in the area. However, there is growing empirical evidence that while climate disasters are rarely the primary trigger for conflict outbreaks, they can exacerbate existing societal tensions—significantly enhancing the risk that a volatile situation will break out in conflict, or that a conflict which might otherwise have subsided will persist (Pain 2013; TLO 2014; Giampoli and Aggarwal 2010; Parenti 2015; Rao and Turkstra 2014; UNEP 2017). Afghanistan is still a rural agrarian country, although its urban centers are expanding rapidly. Due to the combined prospects for economic development and security, combined with the impacts of protracted conflict, disasters and climate change, the urban population has been growing at an annual rate of over 5 percent since 2001. Driving factors for population growth in cities have been natural population growth, rural to urban migration, settlement of Kuchi groups and waves of return of refugees and resettlement of internally displaced persons. Of the latter, an intensification of violence across the north and north-east of the country in 2015 and 2016 has ultimately resulted in all 34 of the provinces hosting IDPs. Some 40 per cent of IDPs are estimated to live in urban areas. Competition for urban land is also exacerbated by the forced and spontaneous return of Afghans from Europe, Iran and Pakistan. Pressures on the urban land market have fueled land grabbing and predatory behavior among state actors and armed groups due to higher property values. For example, a plot of land in Qasimabad, Jalalabad has risen in value from 80-160 USD to 2,000 USD in less than a decade, and urban areas such as Kabul have doubled in population since 2002, resulting in village-sized tracts of informal settlements and increased competition and conflicts over urban property. IDPs also faced repeated threats of forced evictions by both government and private actors. The main threats facing these groups, and the urban poor in general, are: communal violence and tensions related to ownership of land and access to resources; discrimination in access to livelihoods, services and infrastructure; and the potential exploitation and abuse of women and children (Gaston and Dang 2015; Mumtaz 2011; IDMC 2017; Housing, Land and Property Task Force 2017; Metcalf et al 2012). Whether in rural or urban areas, land-related disputes and conflicts have a single overarching impact: fragility and insecurity for the majority of the population, which remains endemic. Understanding the precise role of distinct features of the land system – such as land use and distribution, the legal system, land tenure, gender and land, land administration, land markets, land restitution, de jure and de facto compulsory acquisition and natural resources in land conflict – are necessary in order to recommend government and donor interventions to promoting stability and enhance resilience in the country. Land is almost never the sole cause of conflict but can be a contributing factor. While it may appear that land and resources cause conflict, the reality is much more complicated. Conflicts are driven by physical threats, including direct violence such as forced evictions or violence relating to land access for pastoralists. Conflicts may also be driven by perceived threats to livelihoods and well-being, threats to group identity and a perception that institutions, policies and laws of the state are discriminatory. Moreover, the role that land plays in conflict changes over time. Thus, it is important to understand how each element of the land system contributes to ongoing conflicts. With this understanding, interventions in the land system are likely to be more responsive to local needs and conflict dynamics. Donor coordination and complementarity in the various Afghan Government initiatives are essential, as is meaningful engagement with Afghan stakeholders. For example, foreign consultants developed proposed amendments to the Land Management and the Land Expropriation laws with relatively little participatory consultation. As a result, gaps in the amendments persist. Below is a brief discussion of how each element of the land system contributes to conflict and potential actionable steps to contribute toward conflict mitigation. Rapid population growth, returning refugees and environmental degradation are leading to increased competition over land both in rural areas (for agriculture and livelihoods) and in urban centers (for building), resulting in a deficit of planned and productive land. The manifestations of this competition are evident in land grabbing and usurpation, ethnically based conflicts over land uses relating to grazing rights, evictions and lack of security in urban informal settlements. In urban areas, decades of international assistance and state reconstruction have done little to build the resilience of all urban households, who still fare very poorly on some of the key dimensions of resilience. This is, in part, due to the limited capacity of the Ministry of Urban Development and Housing (MUDH) to develop and implement contextually appropriate spatial plans. Further, conditions for IDP’s are especially tenuous as they face a wide range of physical threats and restrictions to their freedom of movement. They lack access to adequate food, water and housing, and face tenure insecurity because of the prevalence of unplanned, informal developments (UNEP 2013; Hall 2014; Koser 2014; GIRoA 2016b). In rural areas, bringing more land into productive use will improve land management and may contribute to conflict mitigation. For example, better irrigation, soil conservation techniques and extension services for farmers and herders will help to maximize the productivity of existing agricultural and rangelands. Specifically, the mobile livelihoods of pastoralists require access to territory, not individual parcels. Promoting shared management of ‘common resource pools’ such as forests and grazing land water points may better clarify land uses and can contribute to peaceful co-existence. In urban areas, resources and technical support may further assist the Afghan government and MUDH in working on urban-oriented development plans. The Future of Afghan Cities Program (FoAC) has recently provided a reliable and up-to-date dataset, which reflects local ground conditions. MUDH and others can use this comprehensive data for urban planning to guide the growth of urbanization in the coming decade. A National Urban Policy (NUP) and National Spatial Strategy (NSS) are needed to ensure multidimensional and integrated territorial development of city regions. According to MUDH, spatial plans at the city and region levels should be formulated to ensure planned urban growth, improved intermunicipal coordination and targeted city and region investments. In terms of the country’s urban informal settlements, urban upgrading, as has begun in Kabul, may be useful strategy to improve living conditions to create a more secure and stable environment. Upgrading that considers all dimensions of informal settlement living: social, economic, ecological, institutional and spatial through collaborative and participatory planning, which is crucial to promoting peace and harmony. The purpose of land distribution in Afghanistan is to provide for the transfer of land to private persons (including landless farmers), government ministries and municipalities. In theory, the objective of a state land distribution scheme is to ensure sufficient designations and distribution of state lands for purposes including infrastructure, state revenue-producing projects, ministerial (governmental) requirements, agriculture, commercial activities, residential needs in urban areas and humanitarian requirements for adequate shelter for the populace, including vulnerable populations such as IDPs and returning refugees. State land eligible for distribution includes land not required for state purposes and excludes forests, pastures, mines, monuments and land within areas designated urban land. However, unequal land distribution has a deep history: the power to distribute state land has been a tool for the executive, government officials and others involved in state land administration and management to reward political and economic elites to solidify political loyalty and exercise and control power. The result has been widespread land usurpation and land grabbing (even at the scale of whole townships), plus land conflicts and evictions, which disproportionately affect the most vulnerable IDP’s, women and the urban and rural poor. There is no predictable and fair system of land distribution at present. Additionally, the de facto process of land distribution has limited access to desirable and productive land (including urban, peri-urban and agricultural land) and excluded the landless. The results have been numerous: increased landlessness; increased rural-urban migration; and expansion of informal occupation of public land. The most serious implications have been eroded public trust in governance at all levels and creation of an illicit land economy. If unaddressed, far reaching adverse consequences will have a direct bearing on peace and stability (GIRoA 2008; UNAMA 2015; Gebremedhin 2007). The establishment of ARAZI as the Independent Land Authority in 2013, responsible for identifying and clearing ownership of state land as well as managing the distribution and leasing of such land, has been instrumental in moving toward the centralization and ownership of land administration and management. This centralization has contributed to increased coordination and regularization of certain land transactions. However, despite these positive developments, there continues to be significant challenges to the state land distribution legal framework and distribution practices. Efforts to counter widespread distribution of public lands to undeserving beneficiaries at the local, provincial and national levels in ways that strike a delicate balance between efficiency and productivity for government purposes on the one hand, and equity and social justice on the other, is required. An all-encompassing policy for state land distribution that ensures coordination at the highest levels of all ministries that have a stake in land distribution, particularly those that focus on commercial development or humanitarian needs, may create an enabling environment for this to occur. Any policies and a supporting legal and regulatory framework must ensure that access to land is on the basis of defined transparent criteria and requirements for distribution consistent with an overarching economic, land use and social policy. The primary link between land conflict and the land system stems from the limited recognition of customary ownership—and perceptions of ownership—under Afghan law. While customary ownership prevails on a de facto basis, formal law emphasizes the State as the primary landowner. For example, under Executive Decree 83 of 2003, all untitled land in Afghanistan is owned presumptively by the State. Afghan law only recognizes land ownership based on formal documents. Formal documents showing land ownership are rare: historic attempts at formalization yielded little progress and a vast proportion of the maps and surveys, basic or principle books and title deeds—held either with the property owners or with local courts—have been damaged, destroyed or lost during decades of conflict. 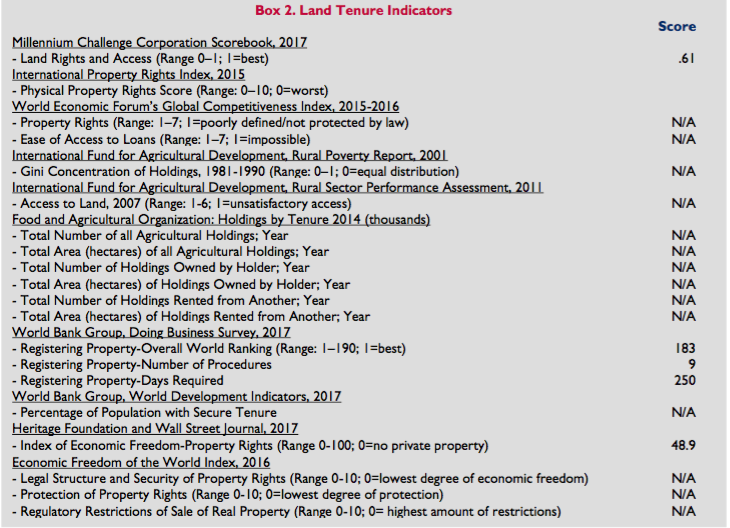 In countries where formal land titling has not been prevalent, land and property law frequently permits some way for de facto or customary landowners to gain legal recognition. In Afghanistan, the mechanism is so limited that it excludes most customary ownership. Nor does land law recognize many forms of communal ownership or use that are customary in Afghanistan. For example, tribes in Khost consider themselves to be the communal owners of large areas of forest, mountain and desert land, which they have been using for long periods of time. Thus, trying to refer inter-tribal disputes over communal lands to ARAZI or any state actor offers no value. Provisions for valid recognition of customary land are possible through adverse possession and provisions of the Law on Managing Land Affairs, but uptake by private land owners is not robust because of the time, costs and effort required for formal land recognition. Finally, the law has been relatively silent in helping IDP’s and returnees obtain a measure of security and freedom from conflict in the face of forced evictions and arbitrary expropriations for those occupying land without permission (GIRoA 1977; GIRoA 2003; UNAMA 2014; GIRoA 2008). Thus, State actors control the vast majority of land that is formally State owned. Lack of formal protections for private landowners and users will continue to lead to exploitation and conflict emerging from the threat posed by wide-scale theft of lands in Afghanistan. For example, gaps in the legal framework have led to the emergence of a flourishing and expanding informal land market. So-called “land mafias,” comprised of the same power brokers working both inside and outside the government, form and perpetuate a self-serving illicit political economy in the country. Land grabbing and usurpation is common. Land grabbing has not been criminalized as such, although the law states that cases can be criminally prosecuted as theft. Such offense carries a maximum sentence of 2 years imprisonment, an inadequate period of incarceration to provide a disincentive to land grabbing. Finally, opium production and illegal trade in natural resources such as minerals and timber can thrive without legal protections. In the end, this illicit political economy has frustrated infrastructure development, mining and other nationally-based programs, as well as those who engage in legitimate business ventures and subsistence farming—all of which detrimentally impact national revenue production, which affects the stability and resilience of both the State and its people. Whether related to the opium trade, extractive industries or land transactions, land conflict drivers affect a far greater proportion of the Afghan people on a daily basis than the ongoing military conflict and perpetuate the no-peace/no-war status quo (UNAMA 2014; Gaston and Dang 2015; Miah 2014). An effective land legal framework must be clear and unambiguous, recognize customary private and community land tenure, fairly balance competing land rights and needs and provide for effective criminal sanctions for land grabbing. Such a framework is critical to strengthening economic stability, government infrastructure development and revenue-producing programs, all of which are contribute to security and rule of law in Afghanistan. However, there are many challenges to establishing and developing such a framework, most notably a lack of will on the part of the politically and economically elite—the primary beneficiaries of the current illicit land economy—to address these challenges. A solution that demonstrates potential benefits to the state, communities and landowners may serve as a point of entry. For example, a legal framework that supports some means for obtaining formal title to all landowners might reduce the risk of repeated land disputes, limit land grabbing, protect property owners’ individual rights, provide a tax basis and offer other potential benefits may enable some level of meaningful level of legal reforms that enable legal recognition of customary, including, communal land rights. Amendments to the Law on Managing Land Affairs (Article 5(5)) currently require that a customary document be based on an original formal land document to obtain legal recognition. However, such documents either do not exist or have been destroyed in the subsequent decades of conflict. Thus, reforms to the legal framework should be flexible in recognizing community and customary land ownership and use may include changing the adverse possession requirement under Article 8 of the 2008 Law on Managing Land Affairs. Since many Afghans became refugees or internally displaced during the country’s three decades of civil strife, the current requirement of 35 years of continuous possession, or the proposed amended language requiring occupation of more than fifteen years before 1979, is too long a period of occupation to establish title for those returning or displaced. According to ARAZI, revisions to law should also be harmonized with the National Land Policy, provide for increased land tenure, identify different types of land holdings, address land grabbing, resolve issues of land management at the local level and address the courts’ role in issuing titles while also adjudicating disputes. Guarantees of tenure and property rights are uncertain in Afghanistan. The causes of tenure insecurity are variable and complex, but weak land rights are rooted in a number of intersecting legal frameworks including constitutional law, state law, religious law, civil law and customary law, that has made the regulatory environment exceptionally complex. For example, as regards women’s land tenure through inheritance, although Islamic law grants women the right of inheritance both as daughters and as widows, Pashtunwali (an ethical code of customs and principles adhered to by many Pashtuns) denies it. The Civil Code is also helpful to women’s land rights, but in practice Afghan women are typically denied their legal right to inheritance and ownership over land or any other immovable property by cultural and traditional norms. The complex and contradicting legal framework for land rights for women is applicable to the land rights status of the country as a whole, and an unenforceable legal system has led to greater insecurity of land rights and increased numbers of land disputes. Insecure land tenure lies at the heart of arbitrary eviction, urban informality, internal displacement and accompanying insecurity, plus ethnically based land use conflicts over water and pastures, illicit poppy production, natural resources exploitation (especially forests and minerals), land grabbing, food insecurity—all of which compromise the resilience of individuals and communities. Moreover, violent disputes and clashes involving housing, land and property in Afghanistan are both a fundamental cause of localized conflict and a perpetuation of weak land tenure, creating a perpetuating cycle of violence and tenure insecurity. Conversely secure land tenure and property rights (LTPR) systems can help the poor in Afghanistan to overcome many of their most pressing challenges: poverty, hunger, conflict, violence, poor governance and lack of economic opportunity. Specifically, secure LTPR can create incentives to improve agricultural productivity, reducing hunger and poverty; promote gender equality and enabling women’s economic empowerment; develop more efficient and stable tax systems that enable greater domestic resource mobilization and improve countries’ abilities to invest in their own development; create incentives to manage valuable natural resources more efficiently and sustainably; mitigates criminal exploitation and transnational crime; improves resilience to shocks and disaster. Further any durable solution to internal displacement requires a safe, permanent and secure place to settle, which puts tenure security at the center of any sustainable option (Nijssen 2011; Schipper and Langston 2015; USAID 2017b). The land-tenure situation in Afghanistan remains opaque, with an ill-suited legal framework and with private entities (individuals and communities) contesting the state’s presumption of ownership over land. Further, patterns of land tenure in Afghanistan vary regionally. Understanding the specific tenure arrangements in geographical contexts and facilitating true tenure security should ultimately provide greater clarity and recognition to the range of land rights and de facto needs for secure land tenure. The findings of the country’s Land Governance Assessment Framework provide legal, policy, administrative and institutional recommendations related to improving land tenure 2 In terms of internal displacement, Afghanistan’s 2013 National Policy on Internally Displaced Persons (IDP Policy) provides IDP’s with the Right to Adequate Housing and Access to Land (Article 7.1.3). The Policy emphasizes that one of the greatest obstacles facing IDPs in Afghanistan in their search for adequate housing is the lack of access to land and security of tenure—which forces IDPs to live in informal settlements where they are at risk of forced eviction and harassment. The IDP Policy enjoins the government to identify available land, make clear arrangements with the respective land owners and hosting communities, and provide emergency and transitional shelters for homeless IDPs. In addition, Annex 4 of the IDP Policy, the Guidelines for Mitigating Harm and Suffering in Situation of Forced Eviction, commits the Government to its obligation under international law to prohibit forced eviction and carry out three obligations before, during and after eviction. Despite existing legal protections and a robust women’s rights campaign by civil society organizations, violence against women is on the rise in the country. Women and girls in Afghanistan continue to face persistent discrimination, violence, street harassment, forced and child marriage, severe restrictions on working and studying outside the home and limited access to justice. Traditional justice systems continue to work against women’s rights, undermining formal legal reform. Women in both rural and urban areas face greater landlessness, with estimates that women hold less than one percent of urban land. Denial of women’s inheritance rights ultimately entrenches poverty at the individual, household and community level and lack of national resilience. Conversely, women’s access to housing, land and property is a crucial element of economic empowerment. It increases participation in household decision-making, expands their range of choices, enables women to deal better with economic loss and crisis and provides them with security and protection (UN Habitat 2015; ECW 2014). ARAZI has enhanced women’s land rights by including wives on Certificates of Occupancy. Additionally, civil-society organizations working for women’s rights within the country assert that the following actions are needed to further secure women’s de facto land rights: mainstreaming the collection and use of gender-disaggregated data in all stages of assessment, program and policy design, monitoring and evaluation; ensuring that women are empowered with the necessary information, knowledge and capacity to effectively participate in decision-making, whether it be a peace-process or a specific land- related to a project or program; recognizing the role of women in conflict mitigation; strengthening or establishing mechanisms to monitor women’s access to land and property and women’s security of tenure, complemented by measures to increase awareness of their land and property rights; encouraging broad-based dialogue at all levels of society regarding the future of land relations among women and men; establish gender-responsive restitution and dispute resolution mechanisms, including: accepting oral evidence, translating procedures into local languages and providing legal assistance. Land administration is defined as the process of determining, recording and disseminating information about ownership, value and use of land and its associated resources, the adjudication of land rights and other attributes, surveying and describing these rights, detailing their documentation and the provision of relevant information to support land markets. Land administration systems should ideally: guarantee ownership and secure tenure; support the land and property tax system; constitute security for credit systems; develop and monitor land markets; protect State lands; facilitate land reform; improve urban planning and infrastructure development; support land management to protect the environment; produce statistical data; and reduce land disputes. In Afghanistan, structural factors such as resource scarcity, demographic pressures, ethnic and tribal diversity and increasing land demand and prices have not caused conflict on their own, but rather the challenges of land institutions to negotiate them have. Specifically, weak, unclear and conflicting land tenure and property rights, as well as the inconsistent ability of state and customary dispute mediation mechanisms to resolve conflicts, at least in part, are a reflection of a land administration system that is not fully functional. These combined factors of structural conflict drivers and weak land administration (and law) have enabled local elites, warlords and political factions, and opportunists to control land and natural resources with intimidation, force and sometimes through customary legal regimes that reflect deeply entrenched power structures (United Nations Economic Commission for Europe 1996; Aggarwal and Giampaoli 2010; Alden Wiley 2003; Tribal Liaison Office 2008). Recent practice and research demonstrates that development of land administration institutions, structures and processes play a role in facilitating state building in general and mitigating institutional weakness specifically (along with adaptation of national land policy, land law and land claims organizations). Further, dispute resolution mechanisms and land administration interventions can enable real settlement of disputes, reduce conflict tensions and to some degree improve the security problems in post-conflict contexts. ARAZI, the independent land authority that has primary responsibility for land administration in Afghanistan, is an emerging government entity, facing a plethora of challenges across the organizational spectrum, but its efforts have been robust with clearly defined long-term objectives. ARAZI has expanded rapidly in a relatively short time frame and has developed a framework for operation including human resources, leadership and government support. It also has growing reputation and awareness within the Afghan government, international community and private sector. A recent project with the United States Institute for Peace shows promise, in the short term, as a model to secure land tenure and forestall small-scale conflicts, through consultation with communities, registration and mapping of customary land holdings and definition of communal boundaries. ARAZI has also evaluated a decade of lessons learned in terms of land administration projects with foreign and financial support to inform future approaches. The organization suffers from a lack of funds for such a significant mandate. In spite of the fact sufficient funds are not fully available from government, significant donor interest exists which could be directed towards supporting the development of ARAZI in the near to medium term. Its strategic long-term goals are to: achieve long term sustainability; become the primary agency for land administration, registration and management in Afghanistan in order to provide a better, joined up, service to citizens and investors alike; assist and facilitate legislative reform in Afghanistan in relation to land administration, registration and management on behalf of the government and in conjunction with the relevant stakeholders; contribute to the simplification and harmonization of Afghanistan’s land laws and decrees; develop and manage a comprehensive computerized land information system to store and process information relating to government and private land, leases entered into by government and other related land rights and revenue information; provide easy, quick and effective one-stop-lease services to local and international investors and defined social groups in line with national priorities and ensure timely, comprehensive and continuous lease execution; and manage unclear and conflicting land tenure and property rights, as well as the inconsistent ability of stateand customary dispute mediation mechanisms to resolve conflicts, at least in part, are a reflection of a land administration system that is not fully functional. These combined factors of structural conflict drivers and weak land administration (and law) have enabled local elites, warlords and political factions, and opportunists to control land and natural resources with intimidation, force and sometimes through customary legal regimes that reflect deeply entrenched power structures (United Nations Economic Commission for Europe 1996; Aggarwal and Giampaoli 2010; Alden Wiley 2003; Tribal Liaison Office 2008). Recent practice and research demonstrates that development of land administration institutions, structures and processes play a role in facilitating state building in general and mitigating institutional weakness specifically (along with adaptation of national land policy, land law and land claims organizations). Further, dispute resolution mechanisms and land administration interventions can enable real settlement of disputes, reduce conflict tensions and to some degree improve the security problems in post-conflict contexts. ARAZI, the independent land authority that has primary responsibility for land administration in Afghanistan, is an emerging government entity, facing a plethora of challenges across the organizational spectrum, but its efforts have been robust with clearly defined long-term objectives. ARAZI has expanded rapidly in a relatively short time frame and has developed a framework for operation including human resources, leadership and government support. It also has growing reputation and awareness within the Afghan government, international community and private sector. A recent project with the United States Institute for Peace shows promise, in the short term, as a model to secure land tenure and forestall small-scale conflicts, through consultation with communities, registration and mapping of customary land holdings and definition of communal boundaries. ARAZI has also evaluated a decade of lessons learned in terms of land administration projects with foreign and financial support to inform future approaches. The organization suffers from a lack of funds for such a significant mandate. In spite of the fact sufficient funds are not fully available from government, significant donor interest exists which could be directed towards supporting the development of ARAZI in the near to medium term. Its strategic long term goals are to: achieve long term sustainability; become the primary agency for land administration, registration and management in Afghanistan in order to provide a better, joined up, service to citizens and investors alike; assist and facilitate legislative reform in Afghanistan in relation to land administration, registration and management on behalf of the government and in conjunction with the relevant stakeholders; contribute to the simplification and harmonization of Afghanistan’s land laws and decrees; develop and manage a comprehensive computerized land information system to store and process information relating to government and private land, leases entered into by government and other related land rights and revenue information; provide easy, quick and effective one-stop-lease services to local and international investors and defined social groups in line with national priorities and ensure timely, comprehensive and continuous lease execution; and manage existing leases effectively and to monitor revenues and returns from the government land lease portfolio (Todorovski et al 2016; Peikar and Stanfield 2016; Gaston and Dang 2015; World Bank 2012). The sale of municipal land and properties is the largest revenue source in Afghanistan’s cities, contributing an average of 22 percent of total annual revenues in Kabul and 19 percent in thirty-three cities throughout the country. Land leases account for an average of 13 percent of revenues, followed by seven percent for property leases. Land values in Afghanistan’s urban areas are on the rise and vacant land plots, subdivided but unoccupied parcels both large and small in and around the cities of Afghanistan, are a major phenomenon. An average of 27 percent of land within the cities are “vacant” as a result of: incremental informal occupation by households; land sales by municipalities; and landgrabbing/usurpation, especially by the elite, warlords and informal power brokers in the wake of a highly speculative urban real estate market. The higher property values and vacant land phenomena, together with a weak land administration system, general insecurity and corruption, have created an enabling environment for widespread land grabbing, estimated at more than 1.2 million jeribs (240,000 hectares), by powerful government officials and their affiliates. Land grabbing, if unmitigated, can lead to subnational social conflict or foment underlying unrest (EMG 2010; GIHCD 2012; GIRoA 2015b; French et al 2016). A transparent, functioning and undistorted land market with secure property rights may serve as a core element of economic development. By permitting the transfer or lease of land rights, an incentive for investment and more efficient allocation of land is facilitated. It also provides a tangible asset for the poor and marginalized groups. Secure property rights and land markets can contribute to the reconstruction of the rule of law, which may serve to create a stable and more democratic peace (French et al 2016). Land administration contributes to peace and enhanced economic development when policy and program options improve urban land markets in ways that support land administration, redress injustices, generate revenues from land taxes and increase access to land and promote urban inclusion. Specifically, MUDH is striving to ensure that it is an institution that is flexible and, forward-looking in ways that ensure that land markets accommodate growth, plan for infrastructure and encourage social integration and inclusion. However, a delicate balance must be struck between the types of interventions that formalize the land market and those that reach a greater proportion of the urban population. A careful approach should support research and participatory mechanisms that will provide contextually appropriate intervention that steer urban land markets toward efficient and inclusive city outcomes. Many who fled conflict during 1978-2001 in Afghanistan are still unable to regain their land and properties through effective restitution procedures, perpetuating ongoing insecurity and conflict due to protracted and ongoing land disputes, illegal land confiscations of returnee lands, unclear ownership rights, dual legal systems (customary and modern), landlessness, land shortages and discrimination against women. The prevailing lack of effective restitution procedures has left hundreds of thousands of returnees unable to return home. In a 2017 survey of nine provinces, one in six people is either a returnee or IDP, totaling 2,416,570 individuals who have either returned from abroad or were internally displaced during the five years between 2012 and June 2017. Displacement, however, continues: between January and May 6, 2017, 91,000 individuals fled their homes due to conflict. The result is inadequate shelter, food insecurity, poor access to sanitation and health facilities, as well as insecurity and lack of protection and dignity (IOM 2017; Alden Wiley 2012). Although land restitution in post-conflict settings is a valuable tool to contribute to state-building, the achievement of a sustainable peace and enhancement of resilience, the issues involved in restitution in Afghanistan are complex. Houses have been destroyed or occupied by others and secondary occupants may themselves have been driven from their homes. Official records proving ownership may have been destroyed or were never entirely accurate to begin with. Ownership and transfer documents are often forged. In some cases, people may have been compelled to sell their land or property under duress. In most cases those who have lived in a particular place for years may not have an official title, because it was in the form of ownership through customary law or Shari’a law. At its core, dispossession has mainly been due to the state’s inability to protect the rights of its citizens and continued displacement continues to exacerbate prospects for restitution (Foley 2008; Unruh 2016; Herrera et al 2016). In this context, organizing a mass restitution program is challenging. The poor performance of the Special Land Disputes Court (2003-2005) indicates that the resolution of restitution cases is extremely difficult. Inconsistency in rulings and alleged demands for bribes delayed restitution. Thus a “one size fits all” approach may not work in Afghanistan with its unique culture, history, grievances, aspirations and ethnic, sectarian, religious and class divisions. Additionally, any restitution program in Afghanistan will have to navigate numerous constraints including: inadequate compensation funds; a low-capacity administrative environment; a variable (un)willingness to evict current occupants; an incomplete legal framework; and low availability of productive rural lands. Good international practice calls for careful consideration of restitution remedies that are realistic, effective and implementable; and what is more important is the ‘structure’ of restitution approaches and how these can be adapted to local and national realities. In general, the structures and processes for restitution should be flexible and adaptable. Restitution is most effectively applied where an enabling environment is in place, which includes sufficient land to accommodate increased demands; safety and security for populations; national coverage by a reliable land records systems, limited overlapping rights and claims and sufficient technical; and financial resources to address restitution issues comprehensively. Specifically, donors can contribute to creating this enabling environment through: revisions to the Law on Managing Land Affairs, which provides an excellent opportunity to rethink how restitution can be fairly and promptly pursued and to lay down a new legal platform for this, since it is currently missing; documenting the history of secondary occupation of land and home through the application of satellite information; accepting alternative forms of evidence, including oral testimony for restitution; facilitating information and legal aid programs; monitoring abandoned land and property during displacement and recording the land and property rights of displaced populations and; establishing a national land and property claims process to collect, analyze and address grievances (Alden Wiley 2013; Unruh 2016; UN Habitat 2012). Land acquisition and resettlement—the loss of one’s home and means of livelihood for many people—is a major dislocation for those subject to it, yet is a part, though small, of Afghanistan’s land law. However, there are issues within the law governing compulsory acquisition vis a vis the Law on Managing Land Affairs that creates a lack of clarity and perceived unfairness. For example, the law does not specifically provide for: resettlement and rehabilitation for vulnerable families; compensation or restoration of business/income loss; or other assistance/rehabilitation measures. A clear definition of what constitutes public purpose is not provided, nor are limitations for arbitrary eviction provided. Neither the Civil Code nor the Constitution specifies what “fair compensation” is or who decides what fair is. Land acquisition for public use, that is alienation, valuation and compensation, unless supported by clear, institutionalized and inclusive protocols that are transparent and predicable, may result in unintended and undesirable negative consequences such as grievances, triggering conflicts between government and landowners. These could potentially escalate and assume political dimensions that further may undermine socio-economic sustainability of particularly the poor as well as constitute a threat to peace and stability Compulsory acquisition law and compensation procedures that respect and protect the tenure rights of poor and marginalized group may serve to lessen conflict—particularly if they institutionalize dialogue as a key strategy to acquire land, as well as set reliable mechanisms for funding required to pay fair and prompt compensation. Compulsory acquisition reforms may also include provisions that ensure that households are resettled in areas that do not diminish their access to housing, land and property. The United Nations’ Voluntary Guidelines on the Responsible Governance of Tenure of Land, Fisheries and Forests in the Context of National Food Security (VGGT) provides standards on compensation specifically and expropriation generally (GIRoA 1977; GIRoA 2004; GIRoA 2008; Alden Wiley 2012; Tagliarino 2017). Afghanistan’s natural resources—its land, water, forests and mineral deposits—are critical to the country’s prospects for a stable, peaceful and more economically viable future. An estimated 70-80 per cent of Afghans rely on agriculture, animal husbandry and artisanal mining for their daily survival. Because of the central role of these resources, any pressures that compromise access to, use of and sustainability of these resources can increase resource competition, potentially leading to conflict. Climate change, conflict, population migrations, water scarcity and unclear land management, tenure and governance represent some of the drivers of resource competition. As a result, natural resources are the source of numerous fracture lines in Afghanistan and the wider region: disputes over land, forests and minerals underlie and drive many conflicts and often serve to exacerbate existing ethnic, political and regional divisions. The division of water at local and transboundary levels, the regional drug trade and illegal smuggling of high value timber already generate tension and conflict. In Afghanistan natural resources play a variety of roles in conflicts and at different scales, locations and intensities. For example, communities, and sometimes countries in the region, fight over scarce resources such as productive land and irrigation water. Powerful stakeholders use natural resources as instruments of coercion to exert control over others, such as upstream farmers controlling access to irrigation water for downstream communities. Natural resources are a source of illicit revenues that have built a powerful war economy and are sustaining serious corruption. Recent investments in mineral and hydrocarbon extraction, if not managed carefully, could generate new problems (UNFTPA 2012; Troell, J. & Nakayama 2013; Sexton 2012). Conversely, effective natural resource management (NRM) contributes to wider peacebuilding in Afghanistan when undertaken to improve resource governance and sustainability. Effective NRM: promotes accountability and transparency; increases community participation; strengthens mechanisms for dispute resolution; reduces competition for resources; and improves transboundary resource management. By creating structures and rules for managing and sharing natural resources, NRM brings order, predictability and trust. In order for NRM to contribute in a positive way to peacebuilding in Afghanistan, it is necessary to first understand existing resource-related conflicts—and their underlying grievances—so that government officials and Afghan civil society groups can properly address land conflict within a broader strategy of conflict prevention. Such a strategy can include: building capacities, at both provincial and district levels, for dispute resolution; encouraging transparency and accountability in NRM; and trying to move beyond ‘zero-sum’ approaches to land disputes. Other NRM measures that contribute to conflict mitigation include: environmental impact assessments; conflict-sensitive approaches for development and humanitarian interventions; provision of capacity-building support to implement best practice NRM structures, processes and laws in a way that is contextually appropriate; facilitation and encouragement of public participation in NRM decision-making, long-term planning and implementation; data collection that enables warnings to identify existing and potential disputes over natural resources; and third-party mediation mechanisms in natural resource dispute resolution, both regionally and nationally.